For other uses, see Kosovo (disambiguation) and Kosova (disambiguation). Kosovo (/ˈkɒsəvoʊ, ˈkoʊ-/; Albanian: Kosova pronounced [kɔˈsɔva] or Kosovë pronounced [kɔˈsɔvə]; Serbian Cyrillic: Косово pronounced [kôsoʋo]), officially the Republic of Kosovo (Albanian: Republika e Kosovës; Serbian: Република Косово/ Republika Kosovo), is a partially recognized state and disputed territory in Southeastern Europe. Pristina is the capital and Prizren is the historic capital of Kosovo. 2014 estimate. A new estimate from 2018 has been added in order to give a more correct GDP per capita. Preliminary results of 2011 census, which excluded four northern Serb-majority municipalities where it could not be carried out. Adopted unilaterally; Kosovo is not a formal member of the eurozone. Assigned 15 December 2016 to Kosovo by ITU. +381 was previously used for fixed lines. Kosovo-licensed mobile-phone providers used +377 (Monaco) or +386 (Slovenia) instead. XK is a "user assigned" ISO 3166 code not designated by the standard, but used by the European Commission, Switzerland, the Deutsche Bundesbank and other organisations. However, ISO 3166-2:RS remains in use. Defined in an area of 10,908 square kilometres (4,212 sq mi), Kosovo is landlocked in the center of the Balkans and bordered by the uncontested territory of Serbia to the north and east, North Macedonia to the southeast, Albania to the southwest and Montenegro to the west. Geographically, Kosovo possesses varied and opposing landscapes for its size determined by the ideal climate along with the geology and hydrology. Most of central Kosovo is dominated by the vast plains and fields of Dukagjin and Kosovo. The Albanian Alps and Šar Mountains rise in the southwest and southeast respectively. The earliest known human settlements in what is now Kosovo were the Paleolithic Vinča and Starčevo cultures. During the Classical period, it was inhabited by the Illyrian-Dardanian and Celtic people. In 168 BC, the area was annexed by the Romans. In the Middle Ages, it was conquered by the Byzantine, Bulgarian and Serbian Empires. The Battle of Kosovo of 1389 is considered to be one of the defining moments in Serbian medieval history. The region was the core of the Serbian medieval state, which has also been the seat of the Serbian Orthodox Church from the 14th century, when its status was upgraded to a patriarchate. Kosovo was part of the Ottoman Empire from the 15th to the early 20th century. In the late 19th century, it became the centre of the Albanian National Awakening. Following their defeat in the Balkan Wars, the Ottomans ceded Kosovo to Serbia and Montenegro. Both countries joined Yugoslavia after World War I, and following a period of Yugoslav unitarianism in the Kingdom, the post-World War II Yugoslav constitution established the Autonomous Province of Kosovo and Metohija within the Yugoslav constituent republic of Serbia. Tensions between Kosovo's Albanian and Serb communities simmered through the 20th century and occasionally erupted into major violence, culminating in the Kosovo War of 1998 and 1999, which resulted in the withdrawal of the Yugoslav army and the establishment of the United Nations Interim Administration Mission in Kosovo. On 17 February 2008, Kosovo unilaterally declared its independence from Serbia. It has since gained diplomatic recognition as a sovereign state by 102 United Nations member states. Serbia does not recognize Kosovo as a sovereign state, although with the Brussels Agreement of 2013, it has accepted its institutions. While Serbia recognizes administration of the territory by Kosovo's elected government, it continues to claim it as the Autonomous Province of Kosovo and Metohija. Kosovo has a lower-middle-income economy and has experienced solid economic growth over the last decade by international financial institutions, and has experienced growth every year since the onset of the 2008 global financial crisis. Kosovo is a member of the International Monetary Fund, World Bank, Regional Cooperation Council, and has applied for membership of Interpol and for observer status in the Organization of the Islamic Cooperation. Dardania in the 4th century during the sovereignty of the Roman Empire. The entire region that today corresponds to the territory is commonly referred to in English simply as Kosovo and in Albanian as Kosova or Kosovë (definite form, Albanian pronunciation: [kɔˈsɔːva]) or Kosovë ("indefinite" form, Albanian pronunciation: [kɔˈsɔːv]). In Serbia, a formal distinction is made between the eastern and western areas; the term Kosovo (Косово) is used for the eastern part centred on the historical Kosovo Field, while the western part is called Metohija (Метохија) (known as Dukagjini in Albanian). According to one theory, Kosovo (Serbian Cyrillic: Косово, Serbo-Croatian pronunciation: [kôsoʋo]) is the Serbian neuter possessive adjective of kos (кос) "blackbird", an ellipsis for Kosovo Polje, 'blackbird field', the name of a plain situated in the eastern half of today's Kosovo and the site of the 1389 Battle of Kosovo Field. The name of the plain was applied to the Kosovo Province created in 1864. Albanians also refer to Kosovo as Dardania, the name of a Roman province formed in 165 BC, which covered the territory of modern Kosovo. The name is derived from ancient tribe of Dardani, ultimately from proto-Albanian word dardha/dardā which means "pear". The former Kosovo President Ibrahim Rugova had been an enthusiastic backer of a "Dardanian" identity and the Kosovan flag and presidential seal refer to this national identity. However, the name "Kosova" remains more widely used among the Albanian population. The current borders of Kosovo were drawn while part of SFR Yugoslavia in 1945, when the Autonomous Region of Kosovo and Metohija (1945–1963) was created as an administrative division of the new People's Republic of Serbia. In 1963, it was raised from the level of an autonomous region to the level of an autonomous province as the Autonomous Province of Kosovo and Metohija (1963–1968). In 1968, the dual name "Kosovo and Metohija" was reduced to a simple "Kosovo" in the name of the Socialist Autonomous Province of Kosovo. In 1990, the province was renamed the Autonomous Province of Kosovo and Metohija. The official conventional long name of the state is Republic of Kosovo, as defined by the Constitution of Kosovo, and is used to represent Kosovo internationally. Additionally, as a result of an arrangement agreed between Pristina and Belgrade in talks mediated by the European Union, Kosovo has participated in some international forums and organisations under the title "Kosovo*" with a footnote stating "This designation is without prejudice to positions on status, and is in line with UNSC 1244 and the ICJ Opinion on the Kosovo declaration of independence". This arrangement, which has been dubbed the "asterisk agreement", was agreed in an 11-point arrangement agreed on 24 February 2012. Goddess on the Throne is one of the most precious archaeological artifacts of Kosovo and has been adopted as the symbol of Pristina. In prehistory, the succeeding Starčevo culture and Vinča culture were active in the region. [unreliable source?] The area in and around Kosovo has been inhabited for nearly 10,000 years. During the Neolithic age, Kosovo lay within the area of the Vinča-Turdaş culture which is characterised by West Balkan black and grey pottery. Bronze and Iron Age tombs have been found in Metohija. The favorable position as well as abundant natural resources were ideal for the development of life since the prehistoric periods, proven by hundreds of archaeological sites discovered and identified throughout Kosovo, which proudly present its rich archeological heritage. The number of sites with archaeological potential is increasing, this as a result of findings and investigations that are carried out throughout Kosovo but also from many superficial traces which offer a new overview of antiquity of Kosovo. The earliest traces documented in the territory of Kosovo belong to the Stone Age Period, namely there are indications that cave dwellings might have existed like for example the Radivojce Cave set near the spring of the Drin river, then there are some indications at Grnčar Cave in the Vitina municipality, Dema and Karamakaz Caves of Peć and others. However, human settlement during the Paleolithic or Old Stone Age is not confirmed yet and not scientifically proven. Ruins of Ancient Ulpiana situated south-east of Pristina. The city played an important role in the development of one of the most important cities in the Roman province of Dardania. Therefore, until arguments of Paleolithic and Mesolithic man are confirmed, Neolithic man, respectively the Neolithic sites are considered as the chronological beginning of population in Kosovo. From this period until today Kosovo has been inhabited, and traces of activities of societies from prehistoric, ancient and up to medieval time are visible throughout its territory. Whereas, in some archaeological sites, multilayer settlements clearly reflect the continuity of life through centuries. During antiquity, the area which now makes up Kosovo was inhabited by various tribal ethnic groups, who were liable to move, enlarge, fuse and fissure with neighbouring groups. As such, it is difficult to locate any such group with precision. The Dardani, whose exact ethno-linguistic affiliation is difficult to determine, were a prominent group in the region during the late Hellenistic and early Roman eras. The area was then conquered by Rome in the 160s BC, and incorporated into the Roman province of Illyricum in 59 BC. Subsequently, it became part of Moesia Superior in AD 87. The region was exposed to an increasing number of 'barbarian' raids from the 4th century AD onwards, culminating with the Slavic migrations of the 6th and 7th centuries. Archaeologically, the early Middle Ages represent a hiatus in the material record, and whatever was left of the native provincial population fused into the Slavs. The subsequent political and demographic history of Kosovo is not known with absolute certainty until the 13th century. Archaeological findings suggest that there was steady population recovery and progression of the Slavic culture seen elsewhere throughout the Balkans. The region was absorbed into the Bulgarian Empire in the 850s, where Byzantine culture was cemented in the region. It was re-taken by the Byzantines after 1018, and became part of the newly established Theme of Bulgaria. As the centre of Slavic resistance to Constantinople in the region, the region often switched between Serbian and Bulgarian rule on one hand and Byzantine on the other, until Serbian Grand Prince Stefan Nemanja secured it by the end of the 12th century. An insight into the region is provided by the Byzantine historian-princess, Anna Comnena, who wrote of "Serbs" being the "main" inhabitants of the region. The zenith of Serbian power was reached in 1346, with the formation of the Serbian Empire. During the 13th and 14th centuries, Kosovo became a political, cultural and religious centre of the Serbian Kingdom. In the late 13th century, the seat of the Serbian Archbishopric was moved to Peć, and rulers centred themselves between Prizren and Skopje, during which time thousands of Christian monasteries and feudal-style forts and castles were erected. Stefan Dušan used Prizren Fortress as the capital of the Empire. When the Serbian Empire fragmented into a conglomeration of principalities in 1371, Kosovo became the hereditary land of the House of Branković. In the late 14th and the 15th centuries parts of Kosovo, the easternmost area of which was located near Pristina, were part of the Principality of Dukagjini, which was later incorporated into an anti-Ottoman federation of all Albanian principalities, the League of Lezhë. Medieval Monuments in Kosovo is a today combined UNESCO World Heritage Site consisting of four Serbian Orthodox churches and monasteries. The constructions were founded by members of Nemanjić dynasty, the most important dynasty of Serbia in the Middle Ages. In the 1389 Battle of Kosovo, Ottoman forces defeated a coalition led by Lazar Hrebeljanović. Some historians, most notably Noel Malcolm argues that the battle of Kosovo in 1389 did not end with an Ottoman victory and "Serbian statehood did survive for another seventy years." Soon after, Lazar's son accepted Turkish nominal vassalage (as did some other Serbian principalities) and Lazar's daughter was married to the Sultan to seal the peace. By 1459, Ottomans conquered the new Serbian capital of Smederevo, leaving Belgrade and Vojvodina under Hungarian rule until second quarter of the 16th century. Kosovo was part of the Ottoman Empire from 1455 to 1912, at first as part of the eyalet of Rumelia, and from 1864 as a separate province (vilayet). During this time, Islam was introduced to the population. The Vilayet of Kosovo was an area much larger than today's Kosovo; it included all today's Kosovo territory, sections of the Sandžak region cutting into present-day Šumadija and Western Serbia and Montenegro along with the Kukës municipality, the surrounding region in present-day northern Albania and also parts of north-western North Macedonia with the city of Skopje (then Üsküp), as its capital. Between 1881 and 1912 (its final phase), it was internally expanded to include other regions of present-day North Macedonia, including larger urban settlements such as Štip (İştip), Kumanovo (Kumanova) and Kratovo (Kratova). Serbs likely formed a majority of Kosovo from the 8th to the mid-19th century. Some scholars, such as the historian Fredrick F. Anscombe, believe that medieval and Ottoman Kosovo was ethnically heterogeneous, with Serbs and Albanians dominating at different times. Kosovo was part of the wider Ottoman region to be occupied by Austrian forces during the Great War of 1683–99, but the Ottomans re-established their rule of the region. Such acts of assistance by the Austrian Empire (then arch-rivals of the Ottoman Empire), or Russia, were always abortive or temporary at best. In 1690, the Serbian Patriarch Arsenije III led thousands people from Kosovo to the Christian north, in what came to be known as the Great Serb Migration. In 1766, the Ottomans abolished the Patriarchate of Peć and fully imposed the jizya on its non-Muslim population. 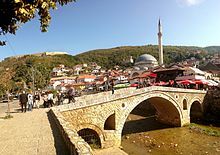 The city of Prizren was the capital of the Serbian Empire and later cultural and intellectual centre of Kosovo during the Ottoman period in the Middle Ages. Although initially stout opponents of the advancing Turks, Albanian chiefs ultimately came to accept the Ottomans as sovereigns. The resulting alliance facilitated the mass conversion of Albanians to Islam. Given that the Ottoman Empire's subjects were divided along religious (rather than ethnic) lines, Islamisation greatly elevated the status of Albanian chiefs. Prior to this, they were organised along simple tribal lines, living in the mountainous areas of modern Albania (from Kruje to the Šar range). Soon, they expanded into a depopulated Kosovo, as well as northwestern Macedonia, although some might have been autochthonous to the region. However, Banac favours the idea that the main settlers of the time were Vlachs. Many Albanians gained prominent positions in the Ottoman government. "Albanians had little cause of unrest", according to author Dennis Hupchik. "If anything, they grew important in Ottoman internal affairs." In the 19th century, there was an awakening of ethnic nationalism throughout the Balkans. The underlying ethnic tensions became part of a broader struggle of Christian Serbs against Muslim Albanians. The ethnic Albanian nationalism movement was centred in Kosovo. In 1878 the League of Prizren (Lidhja e Prizrenit) was formed. This was a political organisation that sought to unify all the Albanians of the Ottoman Empire in a common struggle for autonomy and greater cultural rights, although they generally desired the continuation of the Ottoman Empire. The League was dis-established in 1881 but enabled the awakening of a national identity among Albanians. Albanian ambitions competed with those of the Serbs. 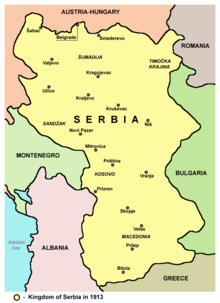 The Kingdom of Serbia wished to incorporate this land that had formerly been within its empire. The modern Albanian-Serbian conflict has its roots in the expulsion of the Albanians in 1877–1878 from areas that became incorporated into the Principality of Serbia. During and after the Serbian–Ottoman War of 1876–78, between 30,000 and 70,000 Muslims, mostly Albanians, were expelled by the Serb army from the Sanjak of Niš and fled to the Kosovo Vilayet. At the turn of the century in 1901, widespread massacres were committed against the Serbian population by the Albanian population across the Kosovo Vilayet. The Young Turk movement took control of the Ottoman Empire after a coup in 1912 which deposed Sultan Abdul Hamid II. The movement supported a centralised form of government and opposed any sort of autonomy desired by the various nationalities of the Ottoman Empire. An allegiance to Ottomanism was promoted instead. An Albanian uprising in 1912 exposed the empire's northern territories in Kosovo and Novi Pazar, which led to an invasion by the Kingdom of Montenegro. The Ottomans suffered a serious defeat at the hands of Albanians in 1912, culminating in the Ottoman loss of most of its Albanian-inhabited lands. The Albanians threatened to march all the way to Salonika and reimpose Abdul Hamid. Division of Kosovo vilayet between the Kingdom of Serbia (yellow) and the Kingdom of Montenegro (green) following the Balkan Wars 1913. See also Albania during the Balkan Wars. A wave of Albanians in the Ottoman army ranks also deserted during this period, refusing to fight their own kin. In September 1912, a joint Balkan force made up of Serbian, Montenegrin, Bulgarian and Greek forces drove the Ottomans out of most of their European possessions. The rise of nationalism unfortunately hampered relations between Albanians and Serbs in Kosovo, due to influence from Russians, Austrians and Ottomans. After the Ottomans' defeat in the First Balkan War, the 1913 Treaty of London was signed with Western Kosovo (Metohija) ceded to the Kingdom of Montenegro and Eastern Kosovo ceded to the Kingdom of Serbia. Soon, there were concerted Serbian colonisation efforts in Kosovo during various periods between Serbia's 1912 takeover of the province and World War II. So the population of Serbs in Kosovo fell after World War II, but it had increased considerably before then. An exodus of the local Albanian population occurred. Serbian authorities promoted creating new Serb settlements in Kosovo as well as the assimilation of Albanians into Serbian society. Numerous colonist Serb families moved into Kosovo, equalising the demographic balance between Albanians and Serbs. 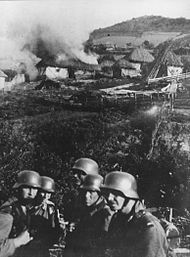 German soldiers set fire to a Serbian village near Mitrovica, circa 1941. In the winter of 1915–16, during World War I, Kosovo saw the retreat of the Serbian army as Kosovo was occupied by Bulgaria and Austria-Hungary. In 1918, the Allied Powers pushed the Central Powers out of Kosovo. After the end of World War I, the Kingdom of Serbia was transformed into the Kingdom of Serbs, Croats and Slovenians on 1 December 1918. Kosovo was split into four counties, three being a part of Serbia (Zvečan, Kosovo and southern Metohija) and one of Montenegro (northern Metohija). However, the new administration system since 26 April 1922 split Kosovo among three districts (oblast) of the Kingdom: Kosovo, Raška and Zeta. 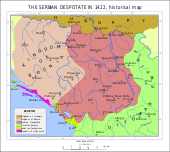 In 1929, the country was transformed into the Kingdom of Yugoslavia and the territories of Kosovo were reorganised among the Banate of Zeta, the Banate of Morava and the Banate of Vardar. In order to change the ethnic composition of Kosovo, between 1912 and 1941 a large-scale Serbian re-colonisation of Kosovo was undertaken by the Belgrade government. Meanwhile, Kosovar Albanians' right to receive education in their own language was denied alongside other non-Slavic or unrecognised Slavic nations of Yugoslavia, as the kingdom only recognised the Slavic Croat, Serb, and Slovene nations as constituent nations of Yugoslavia, while other Slavs had to identify as one of the three official Slavic nations while non-Slav nations were only deemed as minorities. Albanians and other Muslims were forced to emigrate, mainly with the land reform which struck Albanian landowners in 1919, but also with direct violent measures. In 1935 and 1938 two agreements between the Kingdom of Yugoslavia and Turkey were signed on the expatriation of 240,000 Albanians to Turkey, which was not completed because of the outbreak of World War II. After the Axis invasion of Yugoslavia in 1941, most of Kosovo was assigned to Italian-controlled Albania, with the rest being controlled by Germany and Bulgaria. A three-dimensional conflict ensued, involving inter-ethnic, ideological, and international affiliations, with the first being most important. Nonetheless, these conflicts were relatively low-level compared with other areas of Yugoslavia during the war years, with one Serb historian estimating that 3,000 Albanians and 4,000 Serbs and Montenegrins were killed, and two others estimating war dead at 12,000 Albanians and 10,000 Serbs and Montenegrins. An official investigation conducted by the Yugoslav government in 1964 recorded nearly 8,000 war-related fatalities in Kosovo between 1941 and 1945, 5,489 of whom were Serb and Montenegrin and 2,177 of whom were Albanian. It is not disputed that between 1941 and 1945 tens of thousands of Serbs, mostly recent colonists, fled from Kosovo. Estimates range from 30,000 to 100,000. There had been large-scale Albanian immigration from Albania to Kosovo which is by some scholars estimated in the range from 72,000 to 260,000 people (with a tendency to escalate, the last figure being in a petition of 1985). Some historians and contemporary references emphasise that a large-scale migration of Albanians from Albania to Kosovo is not recorded in Axis documents. The province as in its outline today first took shape in 1945 as the Autonomous Kosovo-Metohian Area. Until World War II, the only entity bearing the name of Kosovo had been a political unit carved from the former vilayet which bore no special significance to its internal population. In the Ottoman Empire (which previously controlled the territory), it had been a vilayet with its borders having been revised on several occasions. When the Ottoman province had last existed, it included areas which were by now either ceded to Albania, or found themselves within the newly created Yugoslav republics of Montenegro, or Macedonia (including its previous capital, Skopje) with another part in the Sandžak region of southwest Serbia. Tensions between ethnic Albanians and the Yugoslav government were significant, not only due to ethnic tensions but also due to political ideological concerns, especially regarding relations with neighbouring Albania. Harsh repressive measures were imposed on Kosovo Albanians due to suspicions that there were sympathisers of the Stalinist regime of Enver Hoxha of Albania. In 1956, a show trial in Pristina was held in which multiple Albanian Communists of Kosovo were convicted of being infiltrators from Albania and were given long prison sentences. High-ranking Serbian communist official Aleksandar Ranković sought to secure the position of the Serbs in Kosovo and gave them dominance in Kosovo's nomenklatura. Islam in Kosovo at this time was repressed and both Albanians and Muslim Slavs were encouraged to declare themselves to be Turkish and emigrate to Turkey. At the same time Serbs and Montenegrins dominated the government, security forces, and industrial employment in Kosovo. Albanians resented these conditions and protested against them in the late 1960s, accusing the actions taken by authorities in Kosovo as being colonialist, as well as demanding that Kosovo be made a republic, or declaring support for Albania. After the ouster of Ranković in 1966, the agenda of pro-decentralisation reformers in Yugoslavia, especially from Slovenia and Croatia, succeeded in the late 1960s in attaining substantial decentralisation of powers, creating substantial autonomy in Kosovo and Vojvodina, and recognising a Muslim Yugoslav nationality. As a result of these reforms, there was a massive overhaul of Kosovo's nomenklatura and police, that shifted from being Serb-dominated to ethnic Albanian-dominated through firing Serbs in large scale. Further concessions were made to the ethnic Albanians of Kosovo in response to unrest, including the creation of the University of Pristina as an Albanian language institution. These changes created widespread fear among Serbs that they were being made second-class citizens in Yugoslavia. By the 1974 Constitution of Yugoslavia, Kosovo was granted major autonomy, allowing it to have its own administration, assembly, and judiciary; as well as having a membership in the collective presidency and the Yugoslav parliament, in which it held veto power. In the aftermath of the 1974 constitution, concerns over the rise of Albanian nationalism in Kosovo rose with the widespread celebrations in 1978 of the 100th anniversary of the founding of the League of Prizren. Albanians felt that their status as a "minority" in Yugoslavia had made them second-class citizens in comparison with the "nations" of Yugoslavia and demanded that Kosovo be a constituent republic, alongside the other republics of Yugoslavia. Protests by Albanians in 1981 over the status of Kosovo resulted in Yugoslav territorial defence units being brought into Kosovo and a state of emergency being declared resulting in violence and the protests being crushed. In the aftermath of the 1981 protests, purges took place in the Communist Party, and rights that had been recently granted to Albanians were rescinded – including ending the provision of Albanian professors and Albanian language textbooks in the education system. Due to very high birth rates, the proportion of Albanians increased from 75% to over 90%. In contrast, the number of Serbs barely increased, and in fact dropped from 15% to 8% of the total population, since many Serbs departed from Kosovo as a response to the tight economic climate and increased incidents with their Albanian neighbours. While there was tension, charges of "genocide" and planned harassment have been debunked as an excuse to revoke Kosovo's autonomy. For example, in 1986 the Serbian Orthodox Church published an official claim that Kosovo Serbs were being subjected to an Albanian program of 'genocide'. Even though they were disproved by police statistics,[page needed] they received wide attention in the Serbian press and that led to further ethnic problems and eventual removal of Kosovo's status. Beginning in March 1981, Kosovar Albanian students of the University of Pristina organised protests seeking that Kosovo become a republic within Yugoslavia and demanding their human rights. The protests were brutally suppressed by the police and army, with many protesters arrested. During the 1980s, ethnic tensions continued with frequent violent outbreaks against Yugoslav state authorities, resulting in a further increase in emigration of Kosovo Serbs and other ethnic groups. The Yugoslav leadership tried to suppress protests of Kosovo Serbs seeking protection from ethnic discrimination and violence. The U.S. marines set up a road block near the village of Koretin on 16 June 1999. Inter-ethnic tensions continued to worsen in Kosovo throughout the 1980s. In 1989, Serbian President Slobodan Milošević, employing a mix of intimidation and political manoeuvring, drastically reduced Kosovo's special autonomous status within Serbia and started cultural oppression of the ethnic Albanian population. Kosovo Albanians responded with a non-violent separatist movement, employing widespread civil disobedience and creation of parallel structures in education, medical care, and taxation, with the ultimate goal of achieving the independence of Kosovo. In July 1990, the Kosovo Albanians proclaimed the existence of the Republic of Kosova, and declared it a sovereign and independent state in September 1992. In May 1992, Ibrahim Rugova was elected its president in an election in which only Kosovo Albanians participated. During its lifetime, the Republic of Kosova was only officially recognised by Albania. By the mid-1990s, the Kosovo Albanian population was growing restless, as the status of Kosovo was not resolved as part of the Dayton Agreement of November 1995, which ended the Bosnian War. By 1996, the Kosovo Liberation Army (KLA), an ethnic Albanian guerrilla paramilitary group that sought the separation of Kosovo and the eventual creation of a Greater Albania,[a] had prevailed over the Rugova's non-violent resistance movement and launched attacks against the Yugoslav Army and Serbian police in Kosovo, resulting in the Kosovo War. By 1998, international pressure compelled Yugoslavia to sign a ceasefire and partially withdraw its security forces. Events were to be monitored by Organization for Security and Co-operation in Europe (OSCE) observers according to an agreement negotiated by Richard Holbrooke. The ceasefire did not hold and fighting resumed in December 1998, culminating in the Račak massacre, which attracted further international attention to the conflict. Within weeks, a multilateral international conference was convened and by March had prepared a draft agreement known as the Rambouillet Accords, calling for the restoration of Kosovo's autonomy and the deployment of NATO peacekeeping forces. The Yugoslav delegation found the terms unacceptable and refused to sign the draft. Between 24 March and 10 June 1999, NATO intervened by bombing Yugoslavia aimed to force Milošević to withdraw his forces from Kosovo, though NATO could not appeal to any particular motion of the Security Council of the United Nations to help legitimise its intervention. Combined with continued skirmishes between Albanian guerrillas and Yugoslav forces the conflict resulted in a further massive displacement of population in Kosovo. During the conflict, roughly a million ethnic Albanians fled or were forcefully driven from Kosovo. In 1999 more than 11,000 deaths were reported to the office of the International Criminal Tribunal for the former Yugoslavia prosecutor Carla Del Ponte. As of 2010[update], some 3,000 people were still missing, of which 2,500 are Albanian, 400 Serbs and 100 Roma. By June, Milošević agreed to a foreign military presence in Kosovo and the withdrawal of his troops. After the Yugoslav Army withdrew, over half of Kosovo's Serbs and other non-Albanians flew or were expelled and many of the remaining civilians were subjected to abuse. During the Kosovo War, over 90,000 Serbian and other non-Albanian refugees fled the war-torn province. In the days after the Yugoslav Army withdrew, over 80,000 (almost half of 200,000 estimated to live in Kosovo) Serb and other non-Albanians civilians were expelled from Kosovo and many of the remaining civilians were victims of abuse. After Kosovo and other Yugoslav Wars, Serbia became home to the highest number of refugees and IDPs (including Kosovo Serbs) in Europe. In some villages under Albanian control in 1998, militants drove ethnic-Serbs from their homes. Some of those who remained are unaccounted for and are presumed to have been abducted by the KLA and killed. The KLA detained an estimated 85 Serbs during its 19 July 1998 attack on Orahovac. 35 of these were subsequently released but the others remained. On 22 July 1998, the KLA briefly took control of the Belaćevac mine near the town of Obilić. Nine Serb mineworkers were captured that day and they remain on the International Committee of the Red Cross's list of the missing and are presumed to have been killed. In August 1998, 22 Serbian civilians were reportedly killed in the village of Klečka, where the police claimed to have discovered human remains and a kiln used to cremate the bodies. In September 1998, Serbian police collected 34 bodies of people believed to have been seized and murdered by the KLA, among them some ethnic Albanians, at Lake Radonjić near Glođane (Gllogjan) in what became known as the Lake Radonjić massacre. During and after the 1999 war, over three hundred Serb civilians who were taken across the border into Albania were killed in a "Yellow House" near the town of Burrel and had several of their organs removed for sale on the black market. These claims were investigated first by the ICTY who found medical equipment and traces of blood in and around the house. They were then investigated by the UN, who received witness reports from many ex-UK fighters who stated that several of the prisoners had their organs removed. The Chief Prosecutor for the ICTY, Carla Del Ponte, revealed these crimes to the public in her book, causing a large response. In 2011, a French media outlet France24 released a classified UN document written in 2003 which documented the crimes. The International Criminal Tribunal for the former Yugoslavia (ICTY) prosecuted crimes committed during the Kosovo War. Nine senior Yugoslav officials, including Milošević, were indicted for crimes against humanity and war crimes committed between January and June 1999. Six of the defendants were convicted, one was acquitted, one died before his trial could commence, and one (Milošević) died before his trial could conclude. Six KLA members were charged with crimes against humanity and war crimes by the ICTY following the war, but only one was convicted. On 10 June 1999, the UN Security Council passed UN Security Council Resolution 1244, which placed Kosovo under transitional UN administration (UNMIK) and authorised Kosovo Force (KFOR), a NATO-led peacekeeping force. Resolution 1244 provided that Kosovo would have autonomy within the Federal Republic of Yugoslavia, and affirmed the territorial integrity of Yugoslavia, which has been legally succeeded by the Republic of Serbia. Estimates of the number of Serbs who left when Serbian forces left Kosovo vary from 65,000 to 250,000. Within post-conflict Kosovo Albanian society, calls for retaliation for previous violence done by Serb forces during the war circulated through public culture. Widespread attacks against Serbian cultural sites commenced following the conflict and the return of hundreds of thousands of Kosovo Albanian refugees to their homes. In 2004, prolonged negotiations over Kosovo's future status, sociopolitical problems and nationalist sentiments resulted in the Kosovo unrest. 11 Albanians and 16 Serbs were killed, 900 people (including peacekeepers) were injured, and several houses, public buildings and churches were damaged or destroyed. Camp Bondsteel is the main base of the United States Army under KFOR command in south-eastern part of Kosovo near the city of Ferizaj. International negotiations began in 2006 to determine the final status of Kosovo, as envisaged under UN Security Council Resolution 1244. The UN-backed talks, led by UN Special Envoy Martti Ahtisaari, began in February 2006. Whilst progress was made on technical matters, both parties remained diametrically opposed on the question of status itself. In February 2007, Ahtisaari delivered a draft status settlement proposal to leaders in Belgrade and Pristina, the basis for a draft UN Security Council Resolution which proposed 'supervised independence' for the province. A draft resolution, backed by the United States, the United Kingdom and other European members of the Security Council, was presented and rewritten four times to try to accommodate Russian concerns that such a resolution would undermine the principle of state sovereignty. Russia, which holds a veto in the Security Council as one of five permanent members, had stated that it would not support any resolution which was not acceptable to both Belgrade and Kosovo Albanians. Whilst most observers had, at the beginning of the talks, anticipated independence as the most likely outcome, others have suggested that a rapid resolution might not be preferable. After many weeks of discussions at the UN, the United States, United Kingdom and other European members of the Security Council formally 'discarded' a draft resolution backing Ahtisaari's proposal on 20 July 2007, having failed to secure Russian backing. Beginning in August, a "Troika" consisting of negotiators from the European Union (Wolfgang Ischinger), the United States (Frank G. Wisner) and Russia (Alexander Botsan-Kharchenko) launched a new effort to reach a status outcome acceptable to both Belgrade and Pristina. Despite Russian disapproval, the U.S., the United Kingdom, and France appeared likely to recognise Kosovar independence. A declaration of independence by Kosovar Albanian leaders was postponed until the end of the Serbian presidential elections (4 February 2008). Most EU members and the US had feared that a premature declaration could boost support in Serbia for the nationalist candidate, Tomislav Nikolić. In November 2001, the Organization for Security and Co-operation in Europe supervised the first elections for the Assembly of Kosovo. After that election, Kosovo's political parties formed an all-party unity coalition and elected Ibrahim Rugova as President and Bajram Rexhepi (PDK) as Prime Minister. After Kosovo-wide elections in October 2004, the LDK and AAK formed a new governing coalition that did not include PDK and Ora. This coalition agreement resulted in Ramush Haradinaj (AAK) becoming Prime Minister, while Ibrahim Rugova retained the position of President. PDK and Ora were critical of the coalition agreement and have since frequently accused that government of corruption. Parliamentary elections were held on 17 November 2007. After early results, Hashim Thaçi who was on course to gain 35 per cent of the vote, claimed victory for PDK, the Democratic Party of Kosovo, and stated his intention to declare independence. Thaçi formed a coalition with current president Fatmir Sejdiu's Democratic League which was in second place with 22 percent of the vote. The turnout at the election was particularly low. Most members of the Serb minority refused to vote. Kosovo declared independence from Serbia on 17 February 2008. As of 4 November 2018, 112 UN states recognise its independence, including all of its immediate neighbours, with the exception of Serbia. Since declaring independence, it has become a member of the international institutions such as the International Monetary Fund and World Bank, though not of the United Nations. The Serb minority of Kosovo, which largely opposes the declaration of independence, has formed the Community Assembly of Kosovo and Metohija in response. The creation of the assembly was condemned by Kosovo's President Fatmir Sejdiu, while UNMIK has said the assembly is not a serious issue because it will not have an operative role. On 8 October 2008, the UN General Assembly resolved, on a proposal by Serbia, to ask the International Court of Justice to render an advisory opinion on the legality of Kosovo's declaration of independence. The advisory opinion, which is not binding over decisions by states to recognise or not recognise Kosovo, was rendered on 22 July 2010, holding that Kosovo's declaration of independence was not in violation either of general principles of international law, which do not prohibit unilateral declarations of independence, nor of specific international law – in particular UNSCR 1244 – which did not define the final status process nor reserve the outcome to a decision of the Security Council. Some rapprochement between the two governments took place on 19 April 2013 as both parties reached the Brussels Agreement, an EU brokered agreement that would allow the Serb minority in Kosovo to have its own police force and court of appeals. The agreement is yet to be ratified by either parliament. Kosovo is a multi-party parliamentary representative democratic republic. It is governed by legislative, executive and judicial institutions which derive from the constitution, although until the Brussels Agreement, North Kosovo was in practice largely controlled by institutions of Serbia or parallel institutions funded by Serbia. The legislative is vested in both the Parliament and the ministers within their competencies. The Government exercises the executive power and is composed of the Prime Minister as the head of government, the Deputy Prime Ministers and the Ministers of the various ministries. The judiciary is composed of the Supreme Court and subordinate courts, a Constitutional Court, and independent prosecutorial institutions. There also exist multiple independent institutions defined by the constitution and law, as well as local governments. It specifies that Kosovo is a "secular state" and neutral in matters of religious beliefs. Freedom of belief, conscience and religion is guaranteed with religious autonomy ensured and protected. All citizens are equal before the law and gender equality is ensured by the constitution. The Constitutional Framework guarantees a minimum of ten seats in the 120-member Assembly for Serbs, and ten for other minorities, and also guarantees Serbs and other minorities places in the Government. The president serves as the head of state and represents the unity of the people, elected every five years, indirectly by the parliament through a secret ballot by a two-thirds majority of all deputies. The head of state invested primarily with representative responsibilities and powers. The president has the power to return draft legislation to the parliament for reconsideration and has a role in foreign affairs and certain official appointments. The Prime Minister serves as the head of government elected by the parliament. Ministers are nominated by the Prime Minister, and then confirmed by the parliament. The head of government exercises executive power of the territory. Kosovo participates in the Berlin Process, a diplomatic initiative linked to the future enlargement of the European Union. The foreign relations of Kosovo are conducted through the Ministry of Foreign Affairs in Pristina. As of 2018[update], 108 out of 193 United Nations member states recognise the Republic of Kosovo. Within the European Union, it is recognised by 23 of 28 members and is a potential candidate for the future enlargement of the European Union. Kosovo is member of several international organisations including the International Monetary Fund, World Bank, International Road and Transport Union, Regional Cooperation Council, Council of Europe Development Bank, Venice Commission and European Bank for Reconstruction and Development. In 2015, Kosovo's bid to become a member of UNESCO fell three votes short of the two-third majority required to join. Almost 21 countries maintain diplomatic missions in Kosovo. Kosovo maintains 24 diplomatic missions and 28 consular missions abroad. The relations with Albania are in a special case, considering that the two share the same language. The Albanian language is one of the official languages of Kosovo. Albania has an embassy in the capital Pristina and Kosovo an embassy in Tirana. In 1992, Albania was the only country whose parliament voted to recognise the Republic of Kosova. Albania was also one of the first countries to officially announce its recognition of the Republic of Kosovo in February 2008. The Global Peace Index 2015 ranked Kosovo 69th out of 163 countries. The President holds the title of commander-in-chief of the military. Citizens over the age of 18 are eligible to serve in the Kosovo Security Force. Members of the force are protected from discrimination on the basis of gender or ethnicity. The North Atlantic Treaty Organisation (NATO) led the Kosovo Force (KFOR) and the Kosovo Protection Corps (KPC) in 2008, started preparations for the formation of the Kosovo Security Force. In 2014, the former Prime Minister Hashim Thaçi declared, that the National Government had decided to establish a Defence Ministry in 2019, officially transform the Kosovo Security Forces into the Kosovan Armed Forces, an Army which meets all the standards of NATO members with the aim to join the alliance in the future. The Kosovan Police (Policia e Kosovës) is the main law enforcement agency in Kosovo. The judicial system of Kosovo is a civil law system divided between courts with regular civil and criminal jurisdiction and administrative courts with jurisdiction over litigation between individuals and the public administration. As of the Constitution of Kosovo, the judicial system is composed of the Supreme Court, which is the highest judicial authority, a Constitutional Court, and an independent prosecutorial institution. All of them are administered by the Judicial Council located in Pristina. The Kosovo Police is the main state law enforcement agency in the nation. After the Independence of Kosovo in 2008, the force became the governmental agency. The agency carries nearly all general police duties such as criminal investigation, patrol activity, traffic policing, border control. The Ahtisaari Plan envisaged two forms of international supervision of Kosovo after its independence such as the International Civilian Office (ICO), which would monitor the implementation of the Plan and would have a wide range of veto powers over legislative and executive actions, and the European Union Rule of Law Mission to Kosovo (EULEX), which would have the narrower mission of deploying police and civilian resources with the aim of developing the Kosovo Police and judicial systems but also with its own powers of arrest and prosecution. The declaration of independence and subsequent Constitution granted these bodies the powers assigned to them by the Ahtisaari Plan. Since the Plan was not voted on by the UN Security Council, the ICO's legal status within Kosovo was dependent on the de facto situation and Kosovo legislation; it was supervised by an International Steering Group (ISG) composed of the main states which recognised Kosovo. It was never recognised by Serbia or other non-recognising states. EULEX was also initially opposed by Serbia, but its mandate and powers were accepted in late 2008 by Serbia and the UN Security Council as operating under the umbrella of the continuing UNMIK mandate, in a status-neutral way, but with its own operational independence. The ICO's existence terminated on 10 September 2012, after the ISG had determined that Kosovo had substantially fulfilled its obligations under the Ahtisaari Plan. EULEX continues its existence under both Kosovo and international law; in 2012 the Kosovo president formally requested a continuation of its mandate until 2014. The relations between Kosovo-Albanians and Kosovo-Serbs have been hostile since the rise of nationalism in the Balkans during the 19th century. During Communism in Yugoslavia, the ethnic Albanians and Serbs were strongly irreconcilable, with sociological studies during the Tito-era indicating that ethnic Albanians and Serbs rarely accepted each other as neighbours or friends and few held interethnic marriages. Ethnic prejudices, stereotypes and mutual distrust between ethnic Albanians and Serbs have remained common for decades. The level of intolerance and separation between both communities during the Tito-period was reported by sociologists to be worse than that of Croat and Serb communities in Yugoslavia, which also had tensions but held some closer relations between each other. Despite their planned integration into the Kosovar society and their recognition in the Kosovar constitution, the Romani, Ashkali, and Egyptian communities continue to face many difficulties, such as segregation and discrimination, in housing, education, health, employment and social welfare. Many camps around Kosovo continue to house thousands of Internally Displaced People, all of whom are from minority groups and communities. Because many of the Roma are believed to have sided with the Serbs during the conflict, taking part in the widespread looting and destruction of Albanian property, Minority Rights Group International report that Romani people encounter hostility by Albanians outside their local areas. Typical landscape in Rugova within the Albanian Alps. Kosovo is landlocked and located in the center of the Balkan Peninsula in Southeastern Europe. It is defined in a total area of 10,908 square kilometres (4,212 square miles). It lies between latitudes 42° and 43° N, and longitudes 20° and 22° E.
Kosovo's northernmost point is Bellobërda at 43° 14' 06" northern latitude; the southernmost is Restelica at 41° 56' 40" northern latitude; the westernmost point is Bogë at 20° 3' 23" eastern longitude; and the easternmost point is Desivojca at 21° 44' 21" eastern longitude. The highest point is Đeravica at 2,656 metres (8,714 ft) above sea level, and the lowest is the White Drin at 297 metres (974 ft). The Šar Mountains encompass one-tenth of Kosovo's territory. Most of the Kosovo's borders are dominated by mountainous and high terrain. The most noticeable topographical features are the Albanian Alps and the Šar Mountains. The Albanian Alps, also commonly known as Bjeshkët e Nemuna, are a geological continuation of the Dinaric Alps. The mountains run laterally through the west along the border with Albania and Montenegro. The southeast is predominantly the Šar Mountains, which form the border with North Macedonia. Besides the mountain ranges, Kosovo's territory consists mostly of two major plains: the Kosovo Plain in the east and the Metohija Plain in the west. Kosovo's hydrological resources are relatively small. The longest rivers of Kosovo include the White Drin, the South Morava and the Ibar. Sitnica, a tributary of Ibar, is the largest river lying completely within Kosovo's territory. River Nerodimka represents Europe's only instance of a river bifurcation flowing into the Black Sea and Aegean Sea. Bjeshkët e Nemuna National Park is home to a wide range of flora and fauna species. Located strategically in Southeastern Europe, Kosovo receives species from Europe and Eurasia. Forests are widespread in Kosovo and cover at least 39% of the region. Phytogeographically, it straddles the Illyrian province of the Circumboreal Region within the Boreal Kingdom. In addition, it falls within the Balkan mixed forests terrestrial ecoregion of the Palearctic Temperate broadleaf and mixed forest. Kosovo's biodiversity is conserved in two national parks, eleven nature reserves and one hundred three other protected areas. Both the Prokletije National Park and Šar Mountains National Park are the most important regions of vegetation and biodiversity inside Kosovo. The flora encompasses more than 1,800 species of vascular plant species, but the actual number is estimated to be higher than 2,500 species. The diversity is the result of the complex interaction of geology and hydrology creating a wide variety of habitat conditions for flora growth. Although, Kosovo represents only 2.3% of the entire surface area of the Balkans, in terms of vegetation it has 25% of the Balkan flora and about 18% of the European flora. The fauna is composed of a wide range of species. :14 The mountainous west and southeast provide a great habitat for several rare or endangered species including brown bears, lynxes, wild cats, wolves, foxes, wild goats, roebucks and deers. A total of 255 species of birds have been recorded, with raptors such as the golden eagle, eastern imperial eagle and lesser kestrel living principally in the mountains of Kosovo. Snowy peak of Pashallora as seen from Brezovica. Most of Kosovo experiences a continental climate with mediterranean and alpine influences. The climate is strongly influenced by its proximity to the Adriatic Sea in the west, the Aegean Sea in the south but also the European continental landmass in the north. The coldest areas of Kosovo are the mountains in the west and southeast, where an alpine climate is found. The warmest areas are mostly in the extreme southern areas close to the border with Albania, characterised by the Mediterranean climate. Mean monthly temperature ranges between 0 °C (32 °F) (in January) and 22 °C (72 °F) (in July). Mean annual precipitation ranges from 600 to 1,300 mm (24 to 51 in) per year, and is well distributed year-round. To the northeast, the Kosovo Plain and Ibar Valley are drier with total precipitation of about 600 millimetres (24 inches) per year and more influenced by continental air masses, with colder winters and very hot summers. In the southwest, climatic area of Metohija receives more mediterranean influences with warmer summers, somewhat higher precipitation (700 mm (28 in)) and heavy snowfalls in the winter. The mountainous areas of Prokletije in the west, Šar Mountains on the south and Kopaonik in the north experiences alpine climate, with high precipitation (900 to 1,300 mm (35 to 51 in) per year, short and fresh summers, and cold winters. The average annual temperature of Kosovo is 9.5 °C (49.1 °F). The warmest month is July with average temperature of 19.2 °C (66.6 °F), and the coldest is January with −1.3 °C (29.7 °F). Except Prizren and Istok, all other meteorological stations in January recorded average temperatures under 0 °C (32 °F). Kosovo is divided into seven districts (Albanian: rajon; Serbian: okrug), according to the Law of Kosovo and the Brussels Agreement of 2013, which stipulated the formation of new municipalities with Serb majority populations. The districts are further subdivided into 38 municipalities (komunë; opština). The largest and most populous district of Kosovo is the District of Pristina with the capital in Pristina, having a surface area of 2,470 square kilometres (953.67 sq mi) and a population of 477,312. The population of Kosovo from 1921 to 2015. The population of Kosovo, as defined by Agency of Statistics, was estimated in 2011 to be approximately 1.739.825. The overall life expectancy at birth is 76.7 years; 74.1 years for males and 79.4 years for females. Kosovo ranks 11th most populous in the Balkans and 149th in the world. The population of Kosovo was estimated to be around 1.9 and 2.2 million wherein the Albanians and Serbs constitute the largest ethnic groups followed by other groups such as Bosniak, Gorani, Turkish and Romani. However, according to the 2009 CIA World Factbook, Kosovo's population stands at 1,804,838 persons. It stated that ethnic composition was 88% Albanians, 7% Serbs and 5% of other ethnic groups including Bosniaks, Gorani, Roma, Turks, Ashkalis, Egyptians and Janjevci – Croats. Albanians, steadily increasing in number, may have constituted a majority in Kosovo since the 19th century, although the region's historical ethnic composition is disputed. Kosovo's political boundaries do not quite coincide with the ethnic boundary by which Albanians compose an absolute majority in every municipality; for example, Serbs form a local majority in North Kosovo and two other municipalities, while there are large areas with an Albanian majority outside of Kosovo, namely in the neighbouring regions of former Yugoslavia: the north-west of North Macedonia, and in the Preševo Valley in Southern Serbia. At 1.3% per year as of 2008 data, ethnic Albanians in Kosovo have the fastest rate of growth in population in Europe. Over an 82-year period (1921–2003) the population of Kosovo grew to 460% of its original size. Whereas Albanians constituted 60% of Kosovo's 500,000 person population in 1931, by 1991 they reached 81% of Kosovo's 2 million person population. In the second half of the 20th century, Kosovo Albanians had three times higher birth rates than Serbs. In addition, most of Kosovo's pre-1999 Serb population relocated to Serbia proper following the ethnic cleansing campaign in 1999. Municipalities of Kosovo are largely rural, with only eight municipalities having more than 40,000 inhabitants living in the urban areas. The official languages of Kosovo are Albanian and Serbian and the institutions are committed to ensure the equal use of both languages. Turkish, Bosnian and Roma hold the status of official languages at municipal level if the linguistic community represents at least 5% of the total population of municipality. Albanian is spoken as a first language by approximately 95% of the population, while Bosnian and Serbian are spoken by 1.7% and 1.6% of the population, respectively. Due to the boycott of the census of North Kosovo, Bosnian resulted in being the second largest language after Albanian however, Serbian is de facto the second largest language in Kosovo. Although both, Albanian and Serbian, are official languages, municipal civil servants are only required to speak one of them in a professional setting and, according to Language Commissioner of Kosovo, Slaviša Mladenović, statement from 2015, no organisations have all of their documents in both languages. The Law on the Use of Languages gives Turkish the status of an official language in the municipality of Prizren, irrespective of the size of the Turkish community living there. Kosovo is a secular state with no state religion; freedom of belief, conscience and religion is explicitly guaranteed in the Constitution of Kosovo. The society of Kosovo is strongly secularised and is ranked first in Southern Europe and ninth in the world as free and equal for tolerance towards religion and atheism. In the 2011 census, 95.6% of the population of Kosovo was counted as Muslim and 3.7% as Christian including 2.2% as Roman Catholic and 1.5% as Eastern Orthodox. The remaining 0.20% of the population reported having no religion, or another religion, or did not provided an adequate answer. Protestants, although recognised as a religious group in Kosovo by the government, were not represented in the census. Islam is the most widely practiced religion in Kosovo and was first introduced in the Middle Ages by the Ottomans. Today, Kosovo has the highest percentage of Muslims in Europe after Turkey. The majority of the Muslim population of Kosovo are ethnic Albanians, Turks and Slavs, including Gorani and Bosniaks. Christianity has a long and continuous history in Kosovo which can be traced back to the Roman invasion of the region. During the early and late Middle Ages, the entire Balkan Peninsula had been Christianised initially by the Romans and subsequently by the Byzantine Empire. Followers of the Roman Catholic Church are predominantly Albanians with ethnic Serbs following the Eastern Orthodox Church. In 2008, Protestant pastor Artur Krasniqi, primate of the Kosovo Protestant Evangelical Church, claimed that "as many as 15,000" Kosovar Albanians had converted to Protestantism since 1985. The relations between the Albanian Muslim and Roman Catholic communities in Kosovo are considered good, however both communities have few or no relations with the Serbian Orthodox community. In general, the Albanians of Kosovo define their ethnicity by language and not by religion while religion reflects a distinguishing identity feature among the Slavs of Kosovo. Kosovo has the 5th largest lignite reserves in the world. The economy of Kosovo is a transitional economy. It suffered from the combined results of political upheaval, the following Yugoslav Wars, the Serbian dismissal of Kosovo employees and international sanctions on Serbia of which it was then part. Since the independence in 2008, the economy has grown every year. Despite declining foreign assistance, growth of GDP averaged over 5% a year. This was despite the global financial crisis of 2009 and the subsequent Eurozone crisis. Additionally, the inflation rate has been low. The most economic development has taken place in the trade, retail and construction sectors. Kosovo is highly dependent on remittances from the Diaspora, FDI and other capital inflows. Kosovo's largest trading partners are Albania, Italy, Switzerland, China, Germany and Turkey. The Euro is its official currency. The Government of Kosovo have signed free-trade agreements with Croatia, Bosnia and Herzegovina, Albania and the Republic of Macedonia (now North Macedonia). Kosovo is a Central European Free Trade Agreement (CEFTA) member, agreed with UNMIK, and enjoys a free trade within the non-European Union countries. The secondary sector accounted for 22.60 of GDP and a general workforce of 800.000 employees in 2009. There are several reasons for this stagnation, ranging from consecutive occupations, political turmoil and the War in Kosovo in 1999. The electricity sector is considered as one of the sectors with the greatest potential of development. 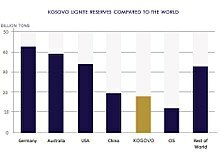 Kosovo has large reserves of lead, zinc, silver, nickel, cobalt, copper, iron and bauxite. The nation has the 5th largest lignite reserves in the world and the 3rd in Europe. The Directorate for Mines and Minerals and the World Bank estimated, that Kosovo had €13.5 billion worth of minerals. The primary sector is based on small to medium-sized family-owned dispersed units. 53% of the nation's area is agricultural land and 41% forest and forestry land, whereas 6% for others. The arable land is mostly used for corn, wheat, pastures, meadows and vineyards. It contributes almost to 35% of GDP including the forestry sector. Wine has historically been produced in Kosovo. The wine industry is successful and has been growing after Kosovo War. The main heartland of Kosovo's wine industry is in Orahovac, where millions of litres of wine are produced. The main cultivars include Pinot noir, Merlot, and Chardonnay. Kosovo exports wines to Germany and the United States. During the "glory days" of the wine industry, grapes were grown from the vineyard area of 9,000ha, divided into private and public ownership, and spread mainly throughout the south and west of Kosovo. The four state-owned wine production facilities were not as much "wineries" as they were "wine factories". Only the Rahovec facility that held approximately 36% of the total vineyard area had the capacity of around 50 million litres annually. The major share of the wine production was intended for exports. At its peak in 1989, the exports from the Rahovec facility amounted to 40 million litres and were mainly distributed to the German market. Brezovica ski resort is one of the most visited winter tourist destinations in Kosovo. The natural values of Kosovo represents quality tourism resources. The description of Kosovo's potential in tourism is closely related to its geographical location, in the center of the Balkan Peninsula in Southeastern Europe. It represents a crossroads which historically dates back to the classical times. Kosovo serves as a link in the connection between Central and Southern Europe, the Adriatic Sea and Black Sea. The mountainous west and southeast of Kosovo has great potential for winter tourism. Skiing takes place at the winter resort of Brezovica within the Šar Mountains. Kosovo is generally rich in various topographical features including high mountains, lakes, canyons, steep rock formations and rivers. Brezovica ski resort, with the close proximity to the Pristina Airport (60 km) and Skopje International Airport (70 km), the resort is a possible destination for international tourists. Other major attractions include the modern capital of Pristina, the historical cities of Prizren, Peć and Gjakova but also Ferizaj and Gjilan. The New York Times included Kosovo on the list of 41 places to visit in 2011. The Pristina International Airport (PRN) handles more than 1.7 million passengers per year. Currently, there are two main motorways in Kosovo: the R7 connecting Kosovo with Albania and the R6 connecting Pristina with the Macedonian border at Elez Han. The construction of the new R7.1 Motorway began in 2017. The R7 Motorway (part of Albania-Kosovo Highway) links Kosovo to Albania's Adriatic coast in Durrës. Once the remaining European route (E80) from Pristina to Merdare section project will be completed, the motorway will link Kosovo through the present European route (E80) highway with the Pan-European corridor X (E75) near Niš in Serbia. The R6 Motorway is currently under construction. Forming part of the E65, it is the second motorway constructed in the region and it links the capital Pristina with the North Macedonian border at Elez Han, which is about 20 km (12 mi) from Skopje. Construction of the motorway started in 2014 and it is going to be finished in 2018. The nation hosts two airports, the Gjakova Airport and the only International Airport of Pristina. The Gjakova Airport was built by the Kosovo Force (KFOR) following the Kosovo War, next to an existing airfield used for agricultural purposes, and was used mainly for military and humanitarian flights. The local and national government plans to offer Gjakova Airport for operation under a public-private partnership with the aim of turning it into a civilian and commercial airport. The Pristina International Airport is located southwest of Pristina. It is Kosovo's only international airport and the only port of entry for air travelers to Kosovo. In the past, Kosovo's capabilities to develop a modern health care system were limited. Low GDP during 1990 worsened the situation even more. However, the establishment of Faculty of Medicine in the University of Pristina marked a significant development in health care. This was also followed by launching different health clinics which enabled better conditions for professional development. Nowadays the situation has changed, and the health care system in Kosovo is organised into three sectors: primary, secondary and tertiary health care. Primary health care in Pristina is organised into thirteen family medicine centres and fifteen ambulantory care units. Secondary health care is decentralised in seven regional hospitals. Pristina does not have any regional hospital and instead uses University Clinical Center of Kosovo for health care services. University Clinical Center of Kosovo provides its health care services in twelve clinics, where 642 doctors are employed. At a lower level, home services are provided for several vulnerable groups which are not able to reach health care premises. Kosovo health care services are now focused on patient safety, quality control and assisted health. The Academy of Sciences and Arts in Pristina. Honorary members include the Albanian-American Nobel Prize winner Ferid Murad and the Albanian Roman Catholic nun Mother Teresa. Education for primary, secondary, and tertiary levels is predominantly public and supported by the state, run by the Ministry of Education. Education takes place in two main stages: primary and secondary education and higher education. The primary and secondary education is subdivided into four stages: preschool education, primary and low secondary education, high secondary education and special education. Preschool education is for children from the ages of one to five. Primary and secondary education is obligatory for everyone. It is provided by gymnasiums and vocational schools and also available in languages of recognised minorities in Kosovo, where classes are held in Albanian, Serbian, Bosnian, Turkish and Croatian. The first phase (primary education) includes grades one to five, and the second phase (low secondary education) grades six to nine. The third phase (high secondary education) consists of general education but also professional education, which is focused on different fields. It lasts four years. However, pupils are offered possibilities of applying for higher or university studies. According to the Ministry of Education, children who are not able to get a general education are able to get a special education (fifth phase). Higher education can be received in universities and other higher-education institutes. These educational institutions offer studies for Bachelor, Master and PhD degrees. The students may choose full-time or part-time studies. Flia is one of the most favored dishes of the traditional Albanian cuisine in Kosovo. The Kosovan cuisine is mixed with influences of the Albanian and Serbian origins of its majority population. Located at crossroad of Albanian, Ottoman, Romance and Slavic cultures, Kosovo has enriched its own cuisine adopting and maintaining some of their cooking traditions and techniques. Food is an important component in the social life of the people of Kosovo particularly during religious holidays such as Christmas, Easter and Ramadan. For festive occasions, Baklava, Lokum and Halva are traditionally prepared in almost every household throughout Kosovo and the Balkans regardless of ethnicity or cultural identity. Perhaps the most prominent and traditional examples of Kosovan food include the Flia and Pite which are served with assorted vegetables, fruit preserves, honey and yogurt. Flia is composed of multiple layered crepe and is predominantly brushed with cream while Pite are filled with a mixture of salty cheese, meat, potatoes or leek. The cuisine of Kosovo features a wide range of fresh fruits, vegetables and herbs such as salt, red and black pepper and vegeta. The people of Kosovo enjoy a wide variety of meat and fish products among other chicken, beef, kebab, suxhuk and lamb which is considered to be the traditional meat for religious occasions due to its religious connections. Tea such as Albanian-style mountain tea or Russian and Turkish-style black tea are a widely consumed beverage throughout Kosovo and particularly served at cafés, restaurants or at home. Coffee is another popular drink although Kosovo is steeped in culture and their coffee culture is a big part of the modern society. Judoka Majlinda Kelmendi, Olympic, World and European Champion. Sport is a significant component of the society and culture of Kosovo. The most prominent sports in Kosovo include football, basketball, judo, boxing, volleyball and handball. The Olympic Committee of Kosovo became a full member of the International Olympic Committee in 2014. It participated at the 2015 European Games in Azerbaijan and the 2016 Summer Olympics in Brazil. The most popular sport in Kosovo is football by far. It was first codified in 1946. In 1922, the first clubs were formed such as the FC Gjakova and FC Prishtina. During the Cold War era from 1945 until 1991, football in former Yugoslavia was advancing so fast that in 1946 it was formed the Federation of Kosovo, as a subsidiary of the Federation of Yugoslavia. Prishtina became the most successful club in the First Leagues of Yugoslavia, while KF Trepça was part of the league for one year. In 1991, the first independent Federation of Kosovo were founded, after all football players, almost from Kosovo, were banned from the League in Yugoslavia. The first game was held in the stadium of Flamurtari on 13 September 1991 in Pristina, which marked in the same time the start of the first independent championship in Kosovo. The governing body is mainly responsible for national team and the most main cup competitions. Bersant Celina was born in Prizren to Albanian parents and he plays for Welsh club Swansea City. Three football players born in Kosovo as Milutin Šoškić, Fahrudin Jusufi, Vladimir Durković were part of Yugoslavia national football team, which won a gold medal at the 1960 Summer Olympics and a silver medal at the 1960 European Championship. Stevan Stojanović from Kosovo, who played for Yugoslavia, was part of Red Star Belgrade and they won 1990–91 European Cup. Nowadays, in many European teams there are players of Albanian origin from Kosovo who have had the opportunity to show their talents and values. Thus, Lorik Cana was the captain of Olympique de Marseille and Sunderland as well as the Albania national team, while Valon Behrami who played for West Ham United, and currently is playing for Udinese and Swiss national football team. There are other players who had the opportunity to play for European football teams such as Xherdan Shaqiri, who plays as a midfielder for Liverpool and for the Switzerland national football team or Adnan Januzaj. Basketball is also one of the favourite sports of the people in Kosovo. The first championship was held in 1991, with the participation of eight teams. The Basketball Federation of Kosovo was accepted as a full member of FIBA on 13 March 2015. Notable players born in Kosovo who played for the successful Yugoslavia and Serbia national teams include Zyfer Avdiu, Marko Simonović and Dejan Musli. Some of them are continued to competing for Serbia after recognition of Kosovo from FIBA. Judoka Majlinda Kelmendi became World Champion in 2013 and 2014, and also the European Champion in 2014. At the Summer Olympics 2016, Kelmendi became the first decorated Kosovan athlete to win a gold medal, also the first gold medal for Kosovo in a major sport tournament. Nora Gjakova won first medal for Kosovo at the European Games, when she earned bronze in 57 kg category. The lahuta is used by Gheg Albanians for the singing of epic songs or Albanian Songs of the Frontier Warriors. Although the music in Kosovo is diverse, authentic Albanian and Serbian music still exist. 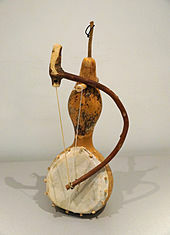 Albanian music is characterised by the use of the Çifteli. Classical music is well known in Kosovo and has been taught at several music schools and universities. In 2014, Kosovo submitted their first film for the Academy Award for Best Foreign Language Film, with Three Windows and a Hanging directed by Isa Qosja. The contemporary music artists Rita Ora, Dua Lipa and Era Istrefi, are all of Albanian origin and have achieved international recognition for their music. One widely recognised musician from Prizren is guitarist Petrit Çeku, winner of several international prizes. Serbian music from Kosovo presents a mixture of traditional music, which is part of the wider Balkan tradition, with its own distinctive sound, and various Western and Turkish influences. Serb songs from Kosovo were an inspiration for 12th song wreath by composer Stevan Mokranjac. Most of Serbian music from Kosovo was dominated by church music, with its own share of sung epic poetry. Serbian national instrument Gusle is also used in Kosovo. Viktorija is the only artist from Kosovo, who represented Yugoslavia in the Eurovision Song Contest as part of Aska in 1982. Singer Rona Nishliu finished 5th in the 2012 Eurovision Song Contest, while Lindita represented Albania in 2017. Several Serbian singers from Kosovo, participates in the Serbian national selection for the Eurovision Song Contest. Nevena Božović represented Serbia in the Junior Eurovision Song Contest and, as member of Moje 3 in the Eurovision Song Contest. The Great Hamam of Pristina was built in the 15th century and was part of the Imperial Mosque in Pristina. The architecture of Kosovo dates back to the Neolithic, Bronze and Middle Ages. It has been influenced by the presence of different civilisations and religions as evidenced by the structures which have survived to this day. Kosovo is home to many Monasteries and Churches from the 13th and 14th century that represents the Serbian Orthodox legacy. Architectural heritage from the Ottoman Period includes mosques and hamams from the 15th, 16th and 17th centuries. Other historical architectural structures of interest include kullas from the 18th and 19th centuries as well as a number of bridges, urban centers and fortresses. While some vernacular buildings are not considered important in their own right, taken together they are of considerable interest. During the 1999 conflict in Kosovo, many buildings that represent this heritage were destroyed or damaged. In the Dukagjini region, at least 500 kullas were attacked, and most of them destroyed or otherwise damaged. In 2004, UNESCO recognised the Visoki Dečani monastery as World Heritage Site for its outstanding universal value. Two years later, the site of patrimony was extended as a serial nomination, to include three other religious monuments: Patriarchate of Peć, Our Lady of Ljeviš and Gračanica monastery under the name of Medieval Monuments in Kosovo. It is consisting of four Serbian Orthodox churches and monasteries which represent the fusion of the eastern Orthodox Byzantine and the western Romanesque ecclesiastical architecture to form the Palaiologian Renaissance style. The construction was founded by members of Nemanjić dynasty, the most important dynasty of Serbia in the Middle Ages. These monuments have come under attack, especially during the 2004 ethnic violence. In 2006, the property was inscribed on the List of World Heritage in Danger due to difficulties in its management and conservation stemming from the region's political instability. Kosovan art was unknown to the international public for a very long time, because of the regime, many artists were unable to display their art in art galleries, and so were always on the lookout for alternatives, and even resorted to taking matters into their own hands. Until 1990, artists from Kosovo presented their art in many prestigious worldwide renowned centers. They were affirmed and evaluated highly because of their unique approach to the arts considering the circumstances in which they were created, making them distinguished and original. On February 1979, the Kosova National Art Gallery was founded. It became the highest institution of visual arts in Kosovo. It was named after one of the most prominent artists of Kosovo Muslim Mulliqi. Engjëll Berisha, Masar Caka, Tahir Emra, Abdullah Gërguri, Hysni Krasniqi, Nimon Lokaj, Aziz Nimani, Ramadan Ramadani, Esat Valla and Lendita Zeqiraj are some of few Albanian painters born in Kosovo. 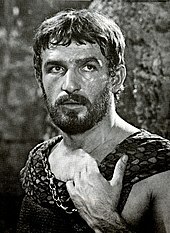 Bekim Fehmiu was the first Eastern European actor to star in Hollywood during the Cold War. The film industry of Kosovo dates from the 1970s. In 1969, the parliament of Kosovo established Kosovafilm, a state institution for the production, distribution and showing of films. Its initial director was the actor Abdurrahman Shala, followed by writer and noted poet Azem Shkreli, under whose direction the most successful films were produced. Subsequent directors of Kosovafilm were Xhevar Qorraj, Ekrem Kryeziu and Gani Mehmetaj. After producing seventeen feature films, numerous short films and documentaries, the institution was taken over by the Serbian authorities in 1990 and dissolved. Kosovafilm was reestablished after Yugoslav withdrawal from the region in June 1999 and has since been endeavoring to revive the film industry in Kosovo. The International Documentary and Short Film Festival is the largest film event in Kosovo. The Festival is organised in August in Prizren which attracts numerous international and regional artists. In this annually organised festival films are screened twice a day in three open air cinemas as well as in two regular cinemas. Except for its films, the festival is also well known for lively nights after the screening. Various events happen within the scope of the festival: workshops, DokuPhoto exhibitions, festival camping, concerts, which altogether turn the city into a charming place to be. In 2010 Dokufest was voted as one of the 25 best international documentary festivals.In 2010 Dokufest was voted as one of the 25 best international documentary festivals. International actors of Albanian origin from Kosovo include Arta Dobroshi, James Biberi, Faruk Begolli and Bekim Fehmiu. The Prishtina International Film Festival is the largest film festival, held annually in Pristina, in Kosovo that screens prominent international cinema productions in the Balkan region and beyond, and draws attention to the Kosovar film industry. The movie Shok was nominated for the Academy Award for Best Live Action Short Film at the 88th Academy Awards. The movie was written and directed by Oscar nominated director Jamie Donoughue, based on true events during the Kosovo war. Shok's distributor is Ouat Media, and the social media campaign is led by Team Albanians. Kosovo ranked 58th in the 2008 Press Freedom Index report compiled by the Reporters Without Borders, while in 2016, it ranked 90th. Afërdita Dreshaj was crowned Miss Universe Kosovo in 2011. The Media consists of different kinds of communicative media such as radio, television, newspapers, and internet web sites. Most of the media survive from advertising and subscriptions. As according to IREX there are 92 radio stations and 22 television stations. Pristina is an important fashion design, production and trade hub in the Albanian-speaking territories. Kosovo has been well documented for its success in global beauty pageantry at Miss Universe. Furthermore, Miss Kosovo is a closely followed event throughout the Kosovo. The first titleholder was Zana Krasniqi, who placed as a Top 10 finalist at the 2008 Miss Universe pageant. She is the first ever Kosovo-Albanian woman to enter and place in the contest finishing 6th, just two-tenths of a point from the top five. The following year turned out to be another success for the Miss Universe Kosovo pageant: Marigona Dragusha placed second runner-up to Miss Universe 2009 in the Bahamas making her to be the first delegate from Kosovo to make it top the top five. In terms of placements, Kosovo has been one of the most successful entrants into the Miss Universe pageant. Ever since debuting in 2008, Kosovo has missed the semi-finals only twice, in 2010 and 2014, beating many countries that have been competing for decades. Katarina Šulkić from Zvečan became 2015 Miss Serbia and Anđelka Tomašević from Zubin Potok represented Serbia at the Miss Earth 2013 and Miss Universe 2014. ^ "Assembly approves Kosovo anthem", b92.net, 11 June 2008. Link accessed 11 June 2008. ^ "Water percentage in Kosovo (Facts about Kosovo; 2011 Agriculture Statistics)". Kosovo Agency of Statistics, KAS. Archived from the original on 29 August 2017. ^ "Demographics of Kosovo (2016)". Geoba.se. Retrieved 29 August 2017. ^ "Gini index". The World Bank. The World Bank. Retrieved 24 January 2019. ^ "Kosovo Human Development Report 2016" (PDF). Ministry for Foreign Affairs of Finland. 2016. Archived (PDF) from the original on 12 December 2016. Retrieved 24 January 2019. ^ "Miratohet Ligji për Prishtinën, Prizreni kryeqytet historik" [Is Approved: The Law for Prishtina, Prizren, the historic capital] (in Albanian). Telegrafi. 17 May 2018. ^ "Kosovo – definition of Kosovo by the Free Online Dictionary, Thesaurus and Encyclopedia". The Free Dictionary. Retrieved 28 October 2013. ^ Coppieters, Bruno; Fotion, Nick (2008). Moral Constraints on War: Principles and Cases (second ed.). Lexington Books. p. 245. ISBN 978-0-7391-2129-0. Archived from the original on 13 August 2016. Retrieved 30 July 2016. ^ Dr. Krylov, Aleksandr. "Is Kosovo Legally Recognised As A State International Law Essay". Analyticon. Archived from the original on 11 July 2016. Retrieved 30 July 2016. ^ Michael Rossi (30 October 2014). "Five more inconvenient truths about Kosovo". TransConflict. Archived from the original on 3 March 2016. ^ Papazoglu, Fanula (1978). 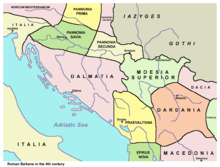 The Central Balkan Tribe in Pre-Roman Times: Triballi, Autariatae, Dardanians, Scordisci and Moesians. ISBN 978-90-256-0793-7. Archived from the original on 3 August 2017. ^ Sharpe, M.E (2003). Ethnic Groups and Population Changes in Twentieth-Century Central-Eastern Europe. p. 364. ISBN 9780765618337. Archived from the original on 3 August 2017. ^ RFE/RL Research Report: Weekly Analyses from the RFE/RL Research Institute, Том 3. Radio Free Europe/Radio Liberty. ^ "Il Kosovo proclama l'indipendenza Serbia: "Non lo riconosceremo mai"". repubblica.it (in Italian). 17 February 2008. ^ a b "7 Years of Kosovo " Howard Smith of Geelong". Archived from the original on 13 April 2015. Retrieved 13 April 2015. ^ Gvosdev, Nikolas K. (24 April 2013). "Kosovo and Serbia Make a Deal". Foreign Affairs. Archived from the original on 5 March 2016. ^ "Kosovo Home". Archived from the original on 19 June 2015. ^ "Constitution of the Republic of Serbia". Parlament.gov.rs. Archived from the original on 27 November 2010. Retrieved 2 January 2011. ^ IBP, Inc. (June 2015). Kosovo Country Study Guide Volume 1 Strategic Information and Developments. International Business Publications Inc. p. 9. ^ Oxford English Dictionary, s.v. 'Kosovar'. ^ Shelley, Fred M. (23 April 2013). Nation Shapes: The Story Behind the World's Borders. p. 73. ISBN 9781610691062. Archived from the original on 16 October 2015. ^ "Constitution of the Republic of Kosovo" (PDF). Prime Minister of Kosovo. 15 June 2008. Archived from the original (PDF) on 26 August 2014. Retrieved 11 November 2014. ^ "Agreement on regional representation of Kosovo". B92. 25 February 2012. Archived from the original on 11 November 2014. Retrieved 11 November 2014. ^ a b Milot Berisha, Archaeological Guide of Kosovo, Prishtinë, Kosovo Archaeological Institute and Ministry of Culture, Youth and Sports, 2012, Pg.7. ^ Milot Berisha, Archaeological Guide of Kosovo, Prishtinë, Kosovo Archaeological Institute and Ministry of Culture, Youth and Sports, 2012, Pg.8. ^ Wilkes, J. J. The Illyrians, 1992, ISBN 0-631-19807-5, p. 85, "... Whether the Dardanians were an Illyrian or a Thracian people has been much debated and one view suggests that the area was originally populated with Thracians who where [sic?] then exposed to direct contact with illyrians over a long period..."
^ "the Dardanians [...] living in the frontiers of the Illyrian and the Thracian worlds retained their individuality and, alone among the peoples of that region succeeded in maintaining themselves as an ethnic unity even when they were militarily and politically subjected by the Roman arms [...] and when at the end of the ancient world, the Balkans were involved in far-reaching ethnic perturbations, the Dardanians, of all the Central Balkan tribes, played the greatest part in the genesis of the new peoples who took the place of the old" The central Balkan tribes in pre-Roman times: Triballi, Autariatae, Dardanians, Scordisci and Moesians, Amsterdam 1978, by Fanula Papazoglu, ISBN 90-256-0793-4, p. 131. ^ Curta 2001, p. 189. ^ Aleksandar Stipčević (1977). The Illyrians: history and culture. Noyes Press. p. 76. ISBN 978-0-8155-5052-5. Archived from the original on 1 January 2016.
the Hungarian attack launched in 1183 with which Nemanja was allied [...] was able to conquer Kosovo and Metohija, including Prizren. ^ Denis P Hupchik. The Balkans. From Constantinople to Communism. Page 93 "Dusan.. established his new state primate's seat at Peć (Ipek), in Kosovo"
^ Sellers, Mortimer (15 April 2010). The Rule of Law in Comparative Perspective. Springer. p. 207. ISBN 978-90-481-3748-0. Archived from the original on 11 May 2011. Retrieved 2 February 2011. ^ "Medieval Monuments in Kosovo". UNESCO. Archived from the original on 13 May 2015. Retrieved 7 September 2016. ^ Barbara Jelavich (29 July 1983). History of the Balkans. Cambridge University Press. pp. 31–. ISBN 978-0-521-27458-6. Archived from the original on 16 October 2015. ^ a b "Essays: 'The battle of Kosovo' by Noel Malcolm, Prospect Magazine May 1998 issue 30". Prospect-magazine.co.uk. Archived from the original on 31 May 2012. Retrieved 20 July 2009. ^ Miranda Vickers (1998). "Chapter 1: Between Serb and Albanian, A History of Kosovo". New York Times. Columbia University Press. Archived from the original on 30 March 2013. ^ a b c Banac, p. 42. ^ Anscombe, Frederick F. (2006). "The Ottoman Empire in recent international politics – II: the case of Kosovo" Archived 14 May 2011 at the Wayback Machine, The International History Review 28 (4) 758–793. ^ "WHKMLA: Habsburg-Ottoman War, 1683–1699". Zum.de. Archived from the original on 19 July 2011. Retrieved 20 July 2009. ^ Fine (1994), p. 51.: "The Albanians were not to create any structure resembling a state until the fifteenth century. However, organised in tribes under their own chieftains, the Albanians dominated the mountains of most of what we today think of as Albania." ^ Cirkovic. Pg 244 "In Kosovo there were visible signs of ethnic change which had accumulated since the Middle Ages with the immigration of Albanian cattle farmers. In addition to the continual flow of settlers and the Islamicisation of urban centres, changes in the population were also caused by political events ... Serbs left territories still under the Sultan's control." ^ Cirkovic. Pg 244 "Since Islamicised Albanians represented a significant portion of the Ottoman armed forces and administration, they did not give up the Empire easily." ^ Frantz, Eva Anne (2009). "Violence and its Impact on Loyalty and Identity Formation in Late Ottoman Kosovo: Muslims and Christians in a Period of Reform and Transformation". Journal of Muslim Minority Affairs. 29 (4): 460–461. doi:10.1080/13602000903411366. ^ Müller, Dietmar (2009). "Orientalism and Nation: Jews and Muslims as Alterity in Southeastern Europe in the Age of Nation-States, 1878–1941". East Central Europe. 36 (1): 70. doi:10.1163/187633009x411485. ^ Pllana, Emin (1985). "Les raisons de la manière de l'exode des refugies albanais du territoire du sandjak de Nish a Kosove (1878–1878) [The reasons for the manner of the exodus of Albanian refugees from the territory of the Sanjak of Niš to Kosovo (1878–1878)] ". Studia Albanica. 1: 189–190. ^ Rizaj, Skënder (1981). "Nënte Dokumente angleze mbi Lidhjen Shqiptare të Prizrenit (1878–1880) [Nine English documents about the League of Prizren (1878–1880)]". Gjurmine Albanologjike (Seria e Shkencave Historike). 10: 198. ^ Şimşir, Bilal N, (1968). Rumeli'den Türk göçleri. Emigrations turques des Balkans [Turkish emigrations from the Balkans]. Vol I. Belgeler-Documents. p. 737. ^ Bataković, Dušan (1992). The Kosovo Chronicles. Plato. Archived from the original on 26 December 2016. ^ Elsie, Robert (2010). Historical Dictionary of Kosovo. Scarecrow Press. p. XXXII. ISBN 9780333666128. ^ Stefanović, Djordje (2005). "Seeing the Albanians through Serbian eyes: The Inventors of the Tradition of Intolerance and their Critics, 1804–1939." European History Quarterly. 35. (3): 470. ^ Iain King; Whit Mason (2006). Peace at Any Price: How the World Failed Kosovo. Cornell University Press. p. 30. ISBN 978-0-8014-4539-2. ^ Erik Zurcher, Ottoman sources of Kemalist thought, (New York, Routledge, 2004), Page. 19. ^ Noel Malcolm, A short history of Kosovo, (London, 1998), Page 248. ^ "Treaty of London, 1913". Mtholyoke.edu. Archived from the original on 1 May 1997. Retrieved 6 November 2011. ^ a b Schabnel, Albrecht; Thakur, Ramesh (eds). Kosovo and the Challenge of Humanitarian Intervention: Selective Indignation, Collective action, and International Citizenship. New York: The United Nations University, 2001. p. 20. ^ Daskalovski, Židas. Claims to Kosovo: Nationalism and Self-determination. In: Florian Bieber & Zidas Daskalovski (eds. ), Understanding the War in Kosovo. L.: Frank Cass, 2003. ISBN 0-7146-5391-8. P. 13-30. ^ Malcolm, Noel. Kosovo: A Short History. Basingstoke: Macmillan, 1998. ISBN 0-333-66612-7. ^ Ramet, Sabrina P. The Kingdom of God or the Kingdom of Ends: Kosovo in Serbian Perception. In Mary Buckley & Sally N. Cummings (eds. ), Kosovo: Perceptions of War and Its Aftermath. L. – N.Y.: Continuum Press, 2002. ISBN 0-8264-5670-7. P. 30-46. ^ Frank, Chaim (2010). Petersen, Hans-Christian; Salzborn, Samuel (eds.). Antisemitism in Eastern Europe: History and Present in Comparison. Bern: Peter Lang. pp. 97–98. ISBN 978-3-631-59828-3. Archived from the original on 16 October 2015. ^ Ramet 2006, p. 141. ^ a b c d e f g Independent International Commission on Kosovo. The Kosovo report: conflict, international response, lessons learned. New York, New York, US: Oxford University Press, 2000. Pp. 35. ^ Melissa Katherine Bokovoy, Jill A. Irvine, Carol S. Lilly. State-society relations in Yugoslavia, 1945–1992. Scranton, Pennsylvania, US: Palgrave Macmillan, 1997. Pp. 295. ^ a b c Melissa Katherine Bokovoy, Jill A. Irvine, Carol S. Lilly. State-society relations in Yugoslavia, 1945–1992. Scranton, Pennsylvania, US: Palgrave Macmillan, 1997. Pp. 296. ^ Melissa Katherine Bokovoy, Jill A. Irvine, Carol S. Lilly. State-society relations in Yugoslavia, 1945–1992. Scranton, Pennsylvania, US: Palgrave Macmillan, 1997. Pp. 301. ^ Independent International Commission on Kosovo. The Kosovo report: conflict, international response, lessons learned. New York, New York, US: Oxford University Press, 2000. Pp. 35–36. ^ a b c Independent International Commission on Kosovo. The Kosovo report: conflict, international response, lessons learned. New York, New York, US: Oxford University Press, 2000. Pp. 36. ^ a b Prentiss, Craig R, ed. (2003). Religion and the Creation of Race and Ethnicity: An Introduction. New York University Press. ISBN 978-0-8147-6701-6. Retrieved 20 July 2009. ^ New York Times 1981-04-19, "One Storm has Passed but Others are Gathering in Yugoslavia"
^ Elsie, Robert. Historical Dictionary of Kosova. Lanham, MD: Scarecrow Press, 2004. ISBN 0-8108-5309-4. ^ Reuters 1986-05-27, "Kosovo Province Revives Yugoslavia's Ethnic Nightmare"
^ Christian Science Monitor 1986-07-28, "Tensions among ethnic groups in Yugoslavia begin to boil over"
^ New York Times 1987-06-27, "Belgrade Battles Kosovo Serbs"
^ a b c Rogel, Carole. Kosovo: Where It All Began. International Journal of Politics, Culture, and Society, Vol. 17, No. 1 (September 2003): 167–82. ^ Clark, Howard. Civil Resistance in Kosovo. London: Pluto Press, 2000. ISBN 0-7453-1569-0. ^ Noel Malcolm, A Short History of Kosovo pp. 346–7. ^ Babuna, Aydın. Albanian national identity and Islam in the post-Communist era. Perceptions 8(3), September–November 2003: 43–69. ^ State-building in Kosovo. A plural policing perspective. Maklu. 5 February 2015. p. 53. ISBN 9789046607497. Archived from the original on 6 March 2016. ^ Liberating Kosovo: Coercive Diplomacy and U. S. Intervention. Belfer Center for Science and International Affairs. 2012. p. 69. ISBN 9780262305129. Archived from the original on 6 March 2016. ^ Dictionary of Genocide. Greenwood Publishing Group. 2008. p. 249. ISBN 9780313346422. Archived from the original on 6 March 2016. ^ Rama, Shinasi A. The Serb-Albanian War, and the International Community's Miscalculations Archived 29 April 2009 at the Wayback Machine. The International Journal of Albanian Studies, 1 (1998), pp. 15–19. ^ "Operation Allied Force". NATO. Archived from the original on 12 September 2016. ^ Larry Minear; Ted van Baarda; Marc Sommers (2000). "NATO and Humanitarian Action in the Kosovo Crisis" (PDF). Brown University. ^ "World: Europe UN gives figure for Kosovo dead". BBC News. 10 November 1999. Archived from the original on 20 April 2010. Retrieved 5 January 2010. ^ KiM Info-Service (7 June 2000). "3,000 missing in Kosovo". BBC News. Archived from the original on 20 April 2010. Retrieved 5 January 2010. ^ a b c d e "Abuses against Serbs and Roma in the new Kosovo". Human Rights Watch. August 1999. Archived from the original on 2 September 2012. ^ Hudson, Robert; Bowman, Glenn (2012). After Yugoslavia: Identities and Politics Within the Successor States. p. 30. ISBN 9780230201316. Archived from the original on 1 January 2016. ^ "Kosovo Crisis Update". UNHCR. 4 August 1999. Archived from the original on 16 October 2015. ^ "Forced Expulsion of Kosovo Roma, Ashkali and Egyptians from OSCE Participated state to Kosovo". OSCE. 6 October 2006. Archived from the original on 26 November 2015. ^ a b c Siobhán Wills (26 February 2009). Protecting Civilians: The Obligations of Peacekeepers. Oxford University Press. p. 219. ISBN 978-0-19-953387-9. Archived from the original on 6 June 2013. Retrieved 24 February 2013. ^ "Abuses against Serbs and Roma in the new Kosovo". Human Rights Watch. August 1999. Archived from the original on 2 September 2012. ^ "After Yugoslavia: Identities and Politics Within the Successor States". 2012. p. 30. Archived from the original on 1 January 2016. ^ "Serbia home to highest number of refugees and IDPs in Europe". B92. 20 June 2010. Archived from the original on 26 March 2017. ^ "Serbia: Europe's largest proctracted refugee situation". OSCE. 2008. Archived from the original on 26 March 2017. ^ UN knew about Kosovo organ trafficking, report says – EXCLUSIVE Archived 13 February 2015 at the Wayback Machine. FRANCE 24. Retrieved on 30 April 2011. ^ "ICTY – TPIY : Judgement List". icty.org. Archived from the original on 1 March 2014. Retrieved 3 March 2014. ^ "ICTY.org" (PDF). Archived (PDF) from the original on 27 August 2010. Retrieved 28 April 2010. ^ "ICTY.org" (PDF). Archived (PDF) from the original on 1 March 2011. Retrieved 28 April 2010. ^ "Second Amended Indictment – Limaj et al" (PDF). Icty.org. Archived (PDF) from the original on 26 July 2011. Retrieved 20 July 2009. ^ "Kosovo ex-PM Ramush Haradinaj cleared of war crimes". BBC News. 29 November 2012. Archived from the original on 29 November 2012. Retrieved 29 November 2012. ^ "Resolution 1244 (1999)". BBC News. 17 June 1999. Archived from the original on 7 April 2008. Retrieved 19 February 2008. ^ European Stability Initiative (ESI): The Lausanne Principle: Multiethnicity, Territory and the Future of Kosovo's Serbs (.pdf) Archived 24 March 2009 at the Wayback Machine, 7 June 2004. ^ Coordinating Centre of Serbia for Kosovo-Metohija: Principles of the program for return of internally displaced persons from Kosovo and Metohija. ^ Herscher 2010, p. 14. ^ András Riedlmayer. "Introduction in Destruction of Islamic Heritage in the Kosovo War, 1998–1999" (PDF). p. 11. ^ Rausch & Banar 2006, p. 246. ^ Egleder 2013, p. 79. ^ "UN frustrated by Kosovo deadlock Archived 7 March 2016 at the Wayback Machine ", BBC News, 9 October 2006. ^ Southeast European Times (29 June 2007). "Russia reportedly rejects fourth draft resolution on Kosovo status". Archived from the original on 2 July 2007. Retrieved 24 July 2009. ^ Southeast European Times (10 July 2007). "UN Security Council remains divided on Kosovo". Archived from the original on 12 October 2007. Retrieved 24 July 2009. ^ James Dancer (30 March 2007). "A long reconciliation process is required". Financial Times. Archived from the original on 8 February 2008. ^ Simon Tisdall (13 November 2007). "Bosnian nightmare returns to haunt EU". The Guardian. UK. ^ "Europe, Q&A: Kosovo's future". BBC News. 11 July 2008. Archived from the original on 23 January 2009. Retrieved 20 July 2009. ^ "Publicinternationallaw.org" (PDF). Archived from the original (PDF) on 21 November 2008. Retrieved 28 April 2010. ^ EuroNews: Ex-guerilla chief claims victory in Kosovo election. Retrieved 18 November 2007. ^ BBC News Archived 3 February 2016 at the Wayback Machine. Retrieved 10 October 2008. ^ "Republic of Kosovo – IMF Staff Visit, Concluding Statement". Imf.org. 24 June 2009. Archived from the original on 29 June 2009. Retrieved 20 July 2009. ^ "World Bank Cauntries". Archived from the original on 16 July 2006. ^ "Kosovo Serbs convene parliament; Pristina, international authorities object (SETimes.com)". SETimes.com. 30 June 2008. Archived from the original on 13 January 2009. Retrieved 20 July 2009. ^ "Advisory Proceedings | International Court of Justice". icj-cij.org. Archived from the original on 8 February 2014. Retrieved 3 March 2014. ^ "Serbia and Kosovo reach EU-brokered landmark accord, BBC News". BBC News. Archived from the original on 8 October 2014. Retrieved 6 October 2014. ^ "Belgrade, Pristina initial draft agreement (Serbian government website)". Archived from the original on 6 October 2014. Retrieved 6 October 2014. ^ a b Jr, Henry H. Perritt (28 September 2009). The Road to Independence for Kosovo: A Chronicle of the Ahtisaari Plan. Cambridge University Press. ISBN 9781139479431. Archived from the original on 16 February 2018 – via Google Books. ^ a b Naamat, Talia; Porat, Dina; Osin, Nina (19 July 2012). Legislating for Equality: A Multinational Collection of Non-Discrimination Norms. Volume I: Europe. Martinus Nijhoff Publishers. ISBN 978-9004226128 – via Google Books. ^ Kosovo Archived 28 August 2012 at the Wayback Machine. ec.europa.eu. ^ "Will the EBRD do the right thing for Kosovo, its newest member?". neurope.eu. 10 February 2013. Archived from the original on 12 February 2013. Retrieved 11 February 2013. ^ "Kosovo fails in UNESCO membership bid". Guardian. 9 November 2015. Archived from the original on 22 October 2017. ^ "Self-proclaimed state of Kosovo fails to become UNESCO member". Russia Today. 10 November 2015. Archived from the original on 7 February 2016. ^ "Foreign Missions in Kosovo". Ministry of Foreign Affairs of the Republic of Kosovo. Archived from the original on 6 May 2016. Retrieved 28 April 2016. ^ "Embassies of the Republic of Kosovo". Ministry of Foreign Affairs of the Republic of Kosovo. Archived from the original on 13 May 2016. Retrieved 28 April 2016. ^ "Consular Missions of the Republic of Kosovo". Ministry of Foreign Affairs of the Republic of Kosovo. Archived from the original on 13 May 2016. Retrieved 28 April 2016. ^ "Law on Service in the Kosovo Security Force". Article 3, Section 3(a), No. Law No. 03/L-082 of 13 June 2008 (PDF). Archived (PDF) from the original on 4 May 2016. Retrieved 7 July 2016. ^ "Kosovo to create national army of 5,000 soldiers". Reuters. 4 March 2014. Archived from the original on 9 March 2014. Retrieved 28 May 2014. ^ Schabnel, Albrecht; Thakur (ed), Ramesh (ed). Kosovo and the Challenge of Humanitarian Intervention: Selective Indignation, Collective Action, and International Citizenship, New York: The United Nations University, 2001. Pp. 20. ^ a b c Schabnel, Albrecht; Thakur (ed), Ramesh (ed), 2001. Pp. 24. ^ "The Roma and "Humanitarian" Ethnic Cleansing in Kosovo". Dissidentvoice.org. Archived from the original on 21 May 2010. Retrieved 19 June 2010. ^ Internal Displacement Monitoring Centre (IDMC) – Norwegian Refugee Council. "IDMC, Internally Displaced persons (IDPs) in Kosovo". Internal-displacement.org. Archived from the original on 21 May 2010. Retrieved 19 June 2010. ^ Internal Displacement Monitoring Centre (IDMC) – Norwegian Refugee Council. "IDMC : Internal Displacement Monitoring Centre, Countries, Kosovo, Roma, Ashkaelia and Egyptians in Kosovo (2006)". Internal-displacement.org. Archived from the original on 14 May 2011. Retrieved 19 June 2010. ^ a b c d CIA (19 June 2014). "World Factbook". CIA. Archived from the original on 6 March 2008. Retrieved 30 January 2014. ^ "PARKU KOMBËTAR "SHARRI"" (PDF). mmph-rks.org (in Albanian). p. 13. Archived (PDF) from the original on 17 August 2016. ^ Kosovo Country Study Guide Strategic Information and Developments (IBP USA ed.). Lulu.com. 3 March 2012. p. 32. ISBN 9781438774763. Archived from the original on 19 October 2017. ^ "Overview of Nature Protection Progress in Kosovo" (PDF). landscapeonline.de (in Albanian). p. 6. Archived (PDF) from the original on 20 October 2017. ^ a b "Qenan Maxhuni: Biodiversiteti i Kosoves" (PDF) (in Albanian). AKMM/IKMN. Archived (PDF) from the original on 3 March 2016. Retrieved 23 February 2013. ^ a b "Kosovo Biodiversity Assessment" (PDF). pdf.usaid.gov. pp. 15–16. Archived (PDF) from the original on 3 March 2017. ^ "Biodiversity conservation status in the Republic of Kosovo with focus on biodiversity centres" (PDF). jeb.co.in. p. 1. Archived (PDF) from the original on 20 October 2017. ^ "Kosovo Biodiversity Assessment" (PDF). pdf.usaid.gov (in Albanian). p. 17. Archived (PDF) from the original on 3 March 2017. ^ "Overview: Climate Change in Albania and Kosovo" (PDF). sustainicum.at. p. 1. Archived (PDF) from the original on 20 October 2017. ^ University of Gothenburg. "Kosovo Environment and Climate Analysis" (PDF). sidaenvironmenthelpdesk.se. p. 3. Archived (PDF) from the original on 16 May 2016. ^ Çavolli, Riza (1993). Gjeografia e Kosovës. p. 23. ^ Kosovo Agency of Statistics. "ESTIMATION of Kosovo population 2011" (PDF). ask.rks-gov.net. Pristina. pp. 12–16. ^ European Centre for Minority Issues (8 January 2013). "_Minority figures in Kosovo census to be used with reservations". infoecmi.eu. ^ Kosovo Agency of Statistics. "Kosovo in Figures (2015)" (PDF). ask.rks-gov.net. p. 17. ^ UNMIK. "Kosovo in figures 2005" (PDF). Ministry of Public Services. Archived from the original (PDF) on 9 March 2008. ^ "Albanian Population Growth". Files.osa.ceu.hu. Archived from the original on 27 February 2008. ^ Krinka Vidakovic Petrov, "Kosovo: Through the Looking Glass," The Israel Journal of Foreign Affairs Vol. 2 No. 1 (Winter 2008), 33–34. ^ On Genetic Interests: Family, Ethnicity, And Humanity in an Age of Mass Migration. Transaction Publishers. 2003. p. 236. ISBN 978-1-4128-3006-5. Archived from the original on 5 June 2013. Retrieved 22 April 2013. In the Serbian province of Kosovo the ethnic Albanian birthrate was over three times that of the ethnic Serbs in the second half of the twentieth century. ^ a b "CONSTITUTION OF THE REPUBLIC OF KOSOVO (with amendments I-XXIV)" (PDF). kuvendikosoves.org. p. 9. ^ "Assessing Minority Language Rights in Kosovo" (PDF). Sapientia University. Archived (PDF) from the original on 4 March 2016. Retrieved 29 June 2015. ^ a b c "Municipal language compliance in Kosovo, June 2014" (PDF). Council of Europe. Archived from the original on 3 July 2015. Retrieved 29 June 2015. ^ "Language in Kosovo". Kosovo Agency of Statistics. Archived from the original on 17 February 2015. ^ "Kosovo Language Commissioner lauds trainings". European Centre for Minority Issues. Archived from the original on 24 September 2015. Retrieved 29 June 2015. ^ "VLERËSIM Popullsia e Kosovës 2015". ask.rks-gov.net (in Albanian). Archived from the original (PDF) on 7 October 2016. ^ "Constitution of the Republic of Kosovo" (PDF). kryeministri-ks.net. p. 17. ^ Olivier Roy, Arolda Elbasani (28 July 2015). The Revival of Islam in the Balkans: From Identity to Religiosity. Springer, 2015. p. 67. ISBN 9781137517845. ^ "Freedom of Thought 2014 report (map)". Freedom of Thought. Archived from the original on 10 October 2017. ^ Mughal ABDUL GHAFFAR. "Muslims in Kosovo: A Socio-economic and Demographic Profile: Is the Muslim Population Exploding?" (PDF). js.ugd.edu.mk. ^ "Muslims in Europe: Country guide". BBC News. 23 December 2005. Archived from the original on 26 January 2009. ^ "Conversion rate". The Economist. 30 December 2008. ISSN 0013-0613. Retrieved 25 December 2018. ^ "Religion in Kosovo" (in German) (International Crisis Group ed.). Pristina and Brussels. 2001: 3. ^ IMF Country Report No 12/100 "Archived copy" (PDF). Archived (PDF) from the original on 24 September 2015. Retrieved 4 October 2012. CS1 maint: Archived copy as title (link) "Unemployment, around 40% of the population, is a significant problem that encourages outward migration and black market activity." ^ "Invest in Kosovo – EU Pillar top priorities: privatisation process and focus on priority economic reforms". Euinkosovo.org. Archived from the original on 28 January 2012. Retrieved 26 March 2013. ^ ""UNMIK and Bosnia and Herzegovina Initial Free Trade Agreement". UNMIK Press Release, 17 February 2006" (PDF). euinkosovo.org. Archived from the original (PDF) on 5 March 2016. ^ "Oda Eknomike e Kosovės/Kosova Chambre of Commerce – Vision". 10 October 2007. Archived from the original on 10 October 2007. ^ "Doing business in Kosovo". buyusa.gov. Archived from the original on 13 July 2009. ^ "Trade Agreements". Kosovo Chamber of Commerce. Archived from the original on 23 April 2014. Retrieved 23 May 2014. ^ Asllan, Pushka. "Gjeografia 12". Libri Shkollor (2005). p. 77. ^ "Projekti Energjetik i Kosovës" (PDF). World Bank. Archived (PDF) from the original on 3 March 2014. Retrieved 2 March 2014. ^ "Kosovo: Natural resources key to the future, say experts". adnkronos.com. Archived from the original on 7 July 2011. Retrieved 17 March 2011. ^ "LIGNITE MINING DEVELOPMENT STRATEGY" (PDF). esiweb.org. Archived (PDF) from the original on 17 June 2010. ^ "World Bank survey puts Kosovo's mineral resources at 13.5bn euros". kosovareport.com. Archived from the original on 8 July 2011. Retrieved 17 March 2011. ^ "Kosovo – Bilateral relations in agriculture" (PDF). Archived (PDF) from the original on 15 April 2017. ^ "5. Agriculture". henrin.grida.no. Archived from the original on 10 October 2017. ^ "Kosovo's wines flowing again". BBC News. 29 October 2011. Archived from the original on 29 October 2011. Retrieved 29 October 2011. ^ "Investing in Kosovo – Vineyards". Archived from the original on 4 April 2013. ^ a b "Investing in Kosovo" (PDF). p. 15. Archived (PDF) from the original on 4 November 2013. Retrieved 27 February 2014. ^ "The 41 Places to Go in 2011". The New York Times. 7 January 2011. Archived from the original on 11 January 2012. ^ "Aktivitetet e Ministrisë së Tregtisë dhe Industrisë: Themelohet Ndërmarrja Publike "Aeroporti i Gjakovës"". Ministria e Tregtisë dhe Industrisë. Archived from the original on 27 February 2015. ^ a b QKMF. (2010–2014). Njesite me Adresa dhe Nr.Telefonit. Available: http://www.prishtina-komuna.org/repository/docs/Qkmf_Prishtin.pdf[permanent dead link]. Last accessed 23 February 2014. ^ "Stafi i QKUK-se". QKUK. Archived from the original on 6 March 2014. Retrieved 23 February 2014. ^ "Statistikat e Shëndetësisë 2012". Kosovo Agency of Statistics. Archived from the original on 2 March 2014. Retrieved 1 March 2014. ^ "INFORMATË – 13 shkurt 2012". Municipality of Prishtina – Republic of Kosovo. Archived from the original on 6 July 2015. Retrieved 2 March 2014. ^ "Strategjia e permiresimit te cilesise se sherbimeve shendetesore 2012–2016" (PDF). Ministry of Health – Republic of Kosovo. Archived from the original (PDF) on 6 March 2014. Retrieved 2 March 2014. ^ "Elementary and secondary education". rks-gov.net. Archived from the original on 18 August 2016. Retrieved 14 April 2017. ^ "COFFEE CULTURE IS ROOTED IN OUR SOCIETY". kosovotwopointzero.com. ^ "127th IOC Session comes to close in Monaco". olympic.org. 9 December 2014. Archived from the original on 4 January 2015. Retrieved 9 December 2014. ^ "History of Football in Kosovo". Archived from the original on 2 March 2014. Retrieved 2 March 2014. ^ "Xherdan Shaqiri: Liverpool sign Stoke forward after triggering release clause". BBC Sport. 13 July 2018. Retrieved 14 July 2018. ^ "History of Sports in Kosovo". The President of Kosovo Office. Archived from the original on 18 March 2013. Retrieved 2 March 2014. ^ "Kosovo becomes 215th National Member Federation of FIBA". FIBA. Archived from the original on 15 March 2015. Retrieved 13 March 2015. ^ MacPhail, Cameron (7 August 2016). "Majlinda Kelmendi makes history with victory in women's judo as Kosovo wins first ever gold medal". rio2016.com. Rio 2016. Archived from the original on 8 August 2016. Retrieved 7 August 2016. ^ "Kosovo". International Olympic Committee. Archived from the original on 25 January 2015. ^ "Oscars: Kosovo Selects 'Three Windows and a Hanging' for Foreign-Language Category". Hollywood Reporter. Archived from the original on 26 September 2014. Retrieved 23 September 2014. ^ Knaus, Warrander, Verena, Gail (2010). Kosovo. Kosovo: Brad Travel Guides. p. 41. ^ Kruta, Beniamin (1990). Vendi i polifonise shqiptare ne polifonike ballkanike. Kultura Popullore. pp. 13–14. ^ "Rita Ora". Archived from the original on 1 May 2012. ^ "Catalogue of the 3rd edition of Dam Festival". ^ a b Warrander, Gail (2011). Kosovo. Bradt Guides. p. 41. ISBN 9781841623313. Archived from the original on 17 August 2017. ^ Biddle, Ian (2013). Music National Identity and the Politics of Location: Between the Global and the Local. Ashgate Publishing, Ltd. ISBN 9781409493778. Archived from the original on 17 August 2017. ^ "Prioritized Intervention List". Regional Programme for Cultural and Natural Heritage in South-east Europe: 8. 23 January 2009. Archived from the original on 2 March 2014. Retrieved 2 March 2014. ^ "Cultural Heritage in South-East: Kosovo". United Nations Educational, Scientific and Cultural Organization: 5. Archived from the original on 22 March 2014. Retrieved 2 March 2014. ^ "Medieval Monuments in Kosovo". UNESCO. 2006. Archived from the original on 13 May 2015. ^ World Heritage Committee puts Medieval Monuments in Kosovo on Danger List and extends site in Andorra, ending this year's inscriptions Archived 2 October 2015 at the Wayback Machine, UNESCO World Heritage Centre, 13 July 2006. Accessed 31 January 2017. ^ "Photography academic invited by President to attend ceremony for popstar Rita Ora". www.dmu.ac.uk. Retrieved 9 May 2018. ^ Library of Congress (2010). Library of Congress Subject Headings. Library of Congress. pp. 4303–. ^ The Guardian Archived 2 December 2016 at the Wayback Machine Retrieved November 2014. ^ Johnson, Zach (14 January 2016). "Oscars 2016 Nominations: Complete List of Nominees". E! Online. Archived from the original on 15 January 2016. Retrieved 14 January 2016. ^ "Wayback Machine" (PDF). 6 May 2014. Archived from the original (PDF) on 6 May 2014. "Kosovo". The World Factbook. Central Intelligence Agency.